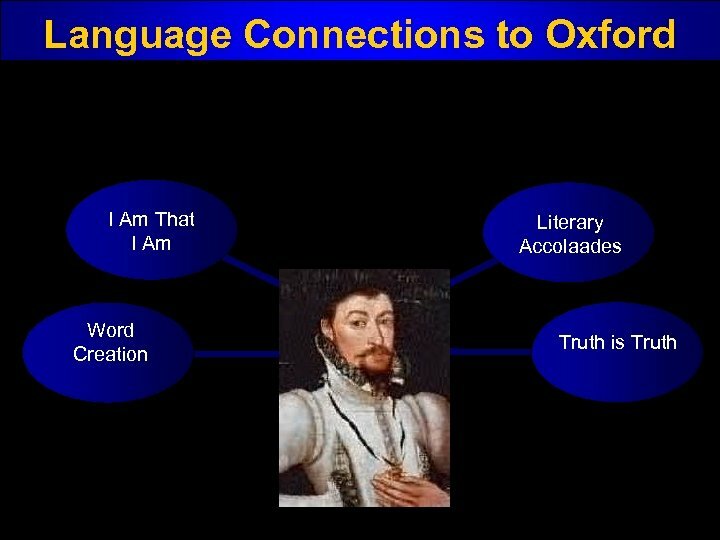 Connection One Connection to Oxford: The Earl of Oxford grew up in Lord Burghley’s household as a ward of the Crown. 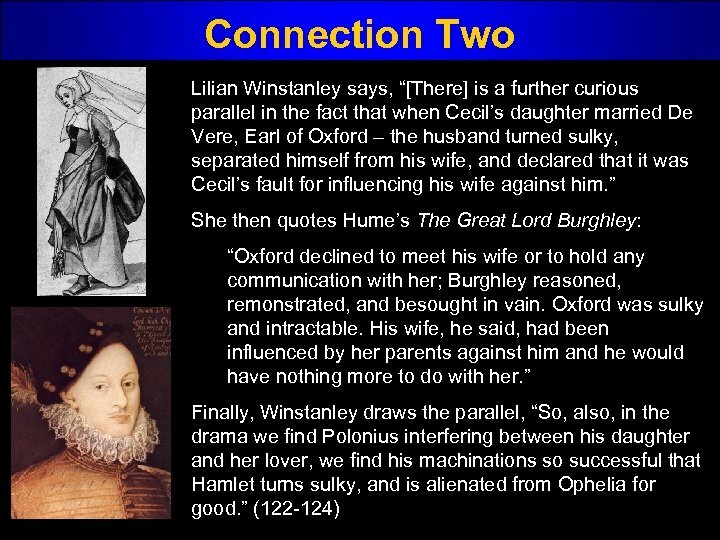 Oxford and Burghley were at odds until Burghley’s death. 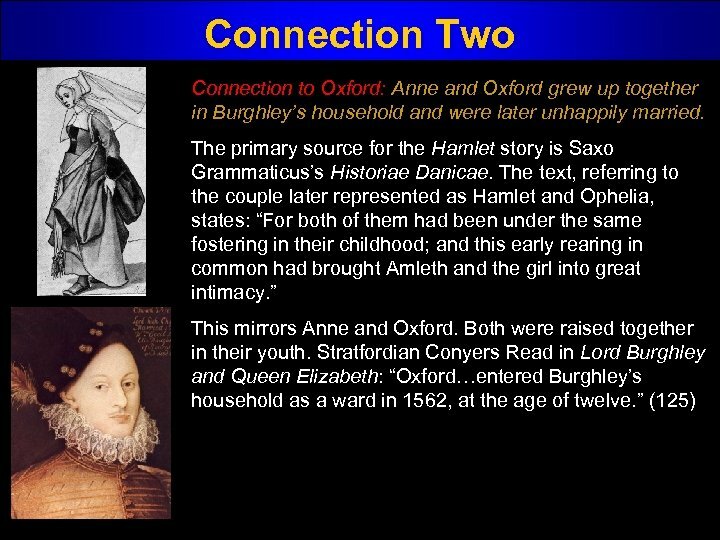 In Lord Burghley and Queen Elizabeth Conyers Read states: “Oxford… entered Burghley’s household as ward in 1562. 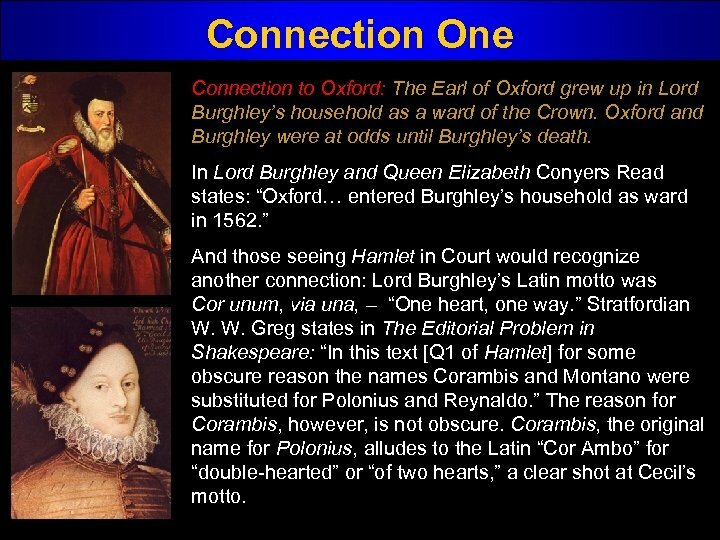 ” And those seeing Hamlet in Court would recognize another connection: Lord Burghley’s Latin motto was Cor unum, via una, – “One heart, one way. 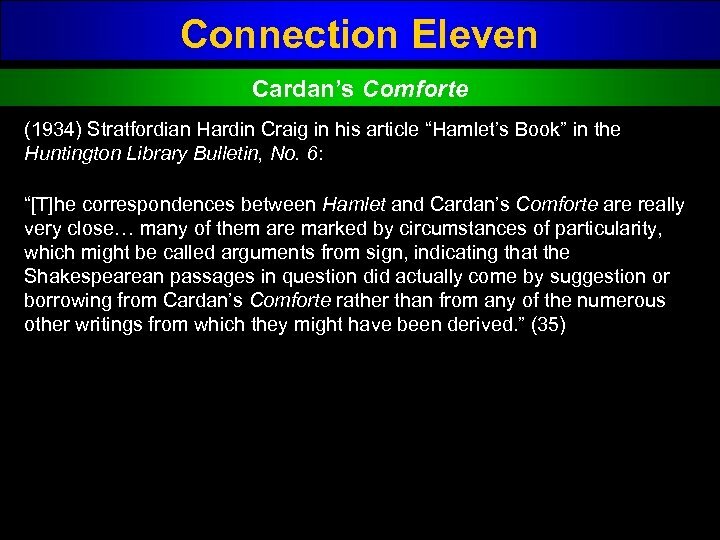 ” Stratfordian W. W. Greg states in The Editorial Problem in Shakespeare: “In this text [Q 1 of Hamlet] for some obscure reason the names Corambis and Montano were substituted for Polonius and Reynaldo. 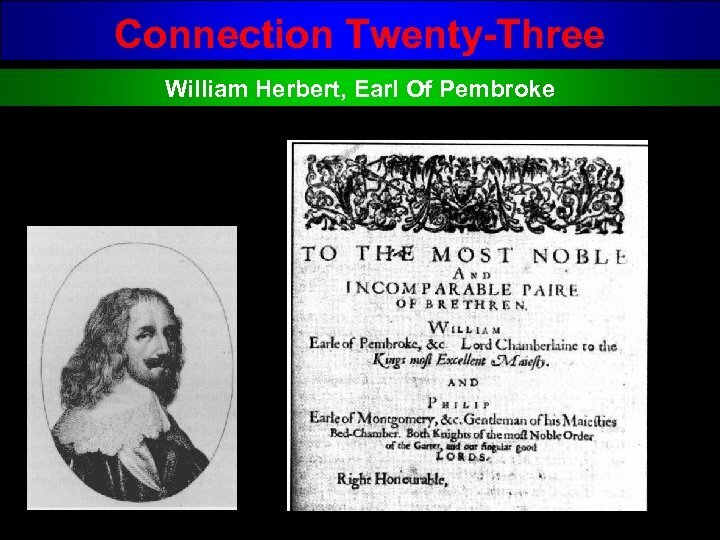 ” The reason for Corambis, however, is not obscure. 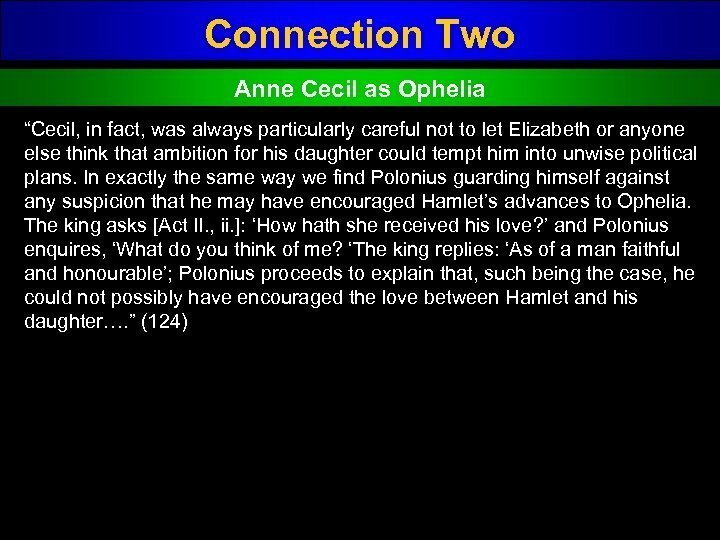 Corambis, the original name for Polonius, alludes to the Latin “Cor Ambo” for “double hearted” or “of two hearts, ” a clear shot at Cecil’s motto. Connection to Shakspere ? 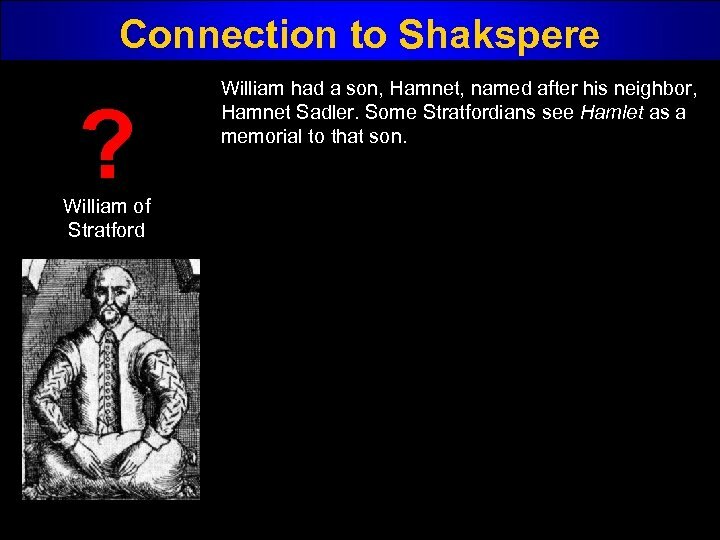 William of Stratford William had a son, Hamnet, named after his neighbor, Hamnet Sadler. 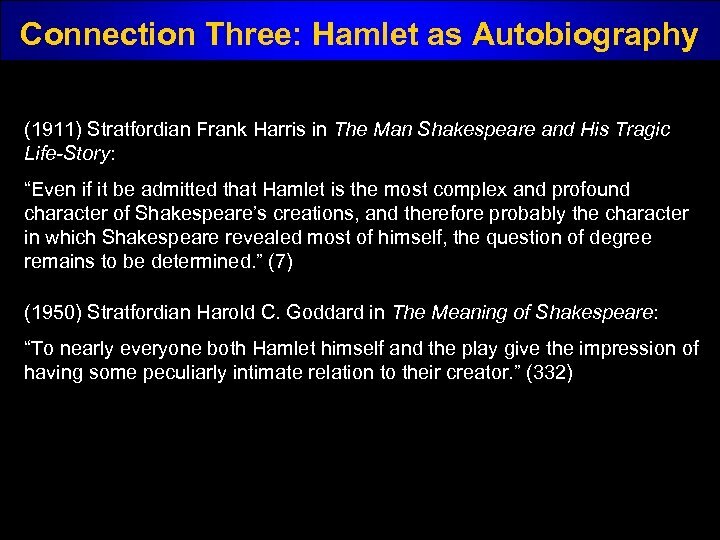 Some Stratfordians see Hamlet as a memorial to that son. 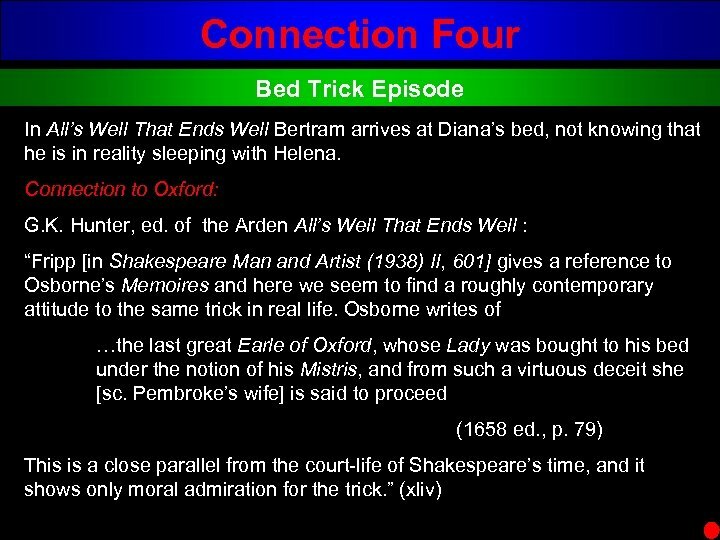 Connection Three The Earl of Oxford as Hamlet Connection to Oxford: There are many striking parallels between Oxford and Hamlet. 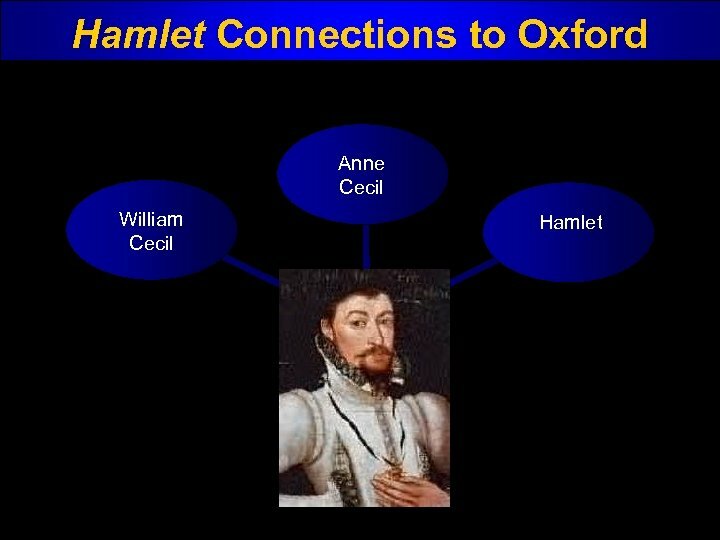 The several connections already discussed demand that we acknowledge the parallels between Hamlet and Oxford: • Both were noblemen and courtiers. 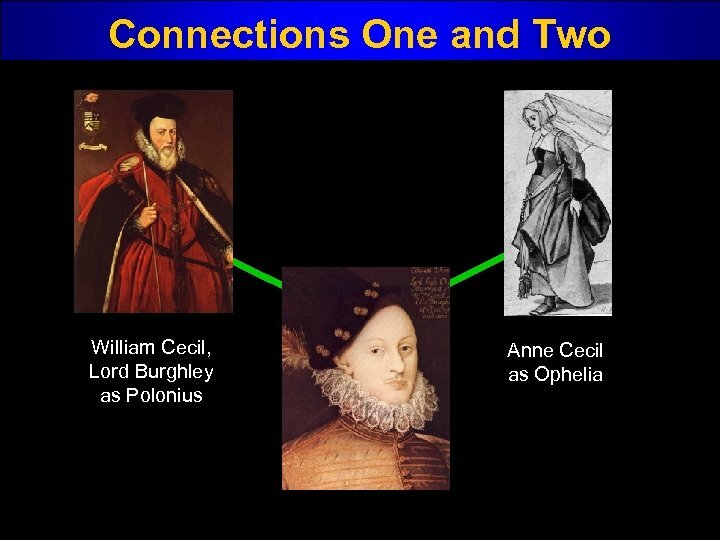 • Both had mothers who remarried after their father’s death. 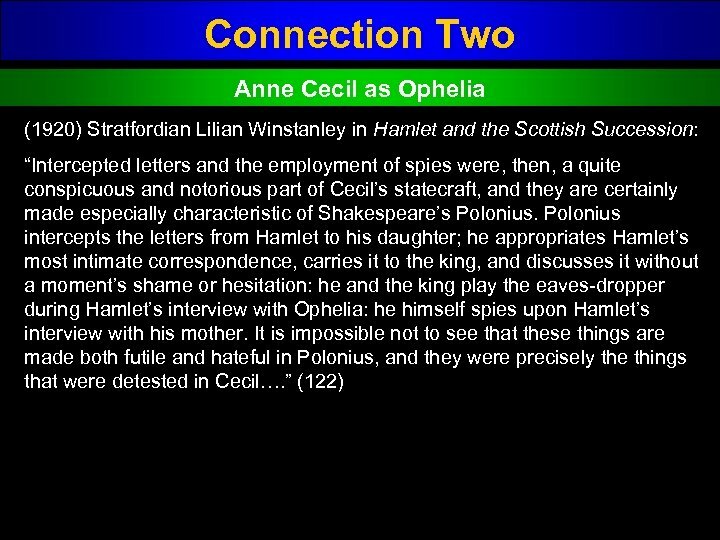 • Both were spied upon by Polonius/Burghley. 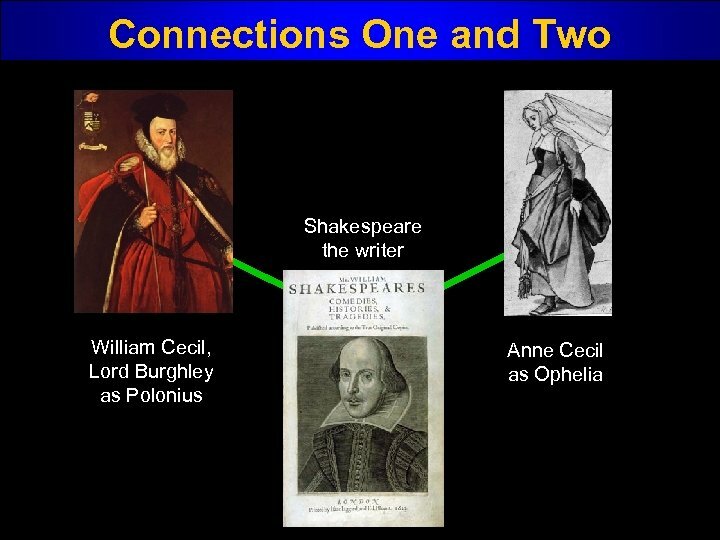 • Both were patrons to players. 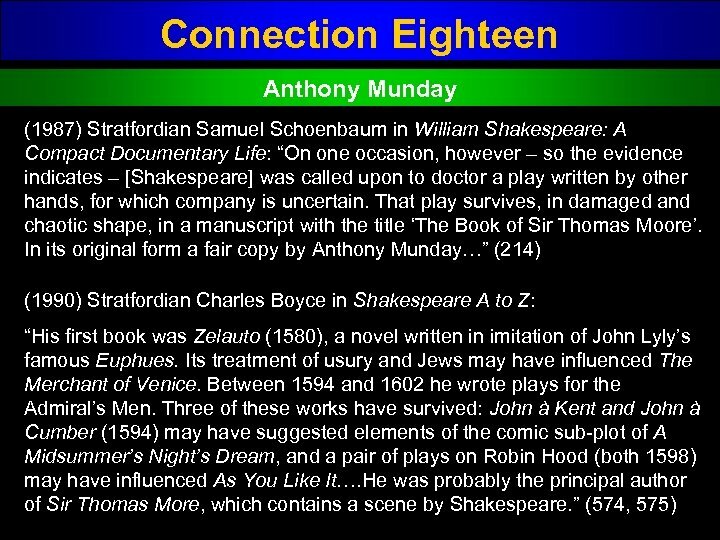 • Both were playwrights. 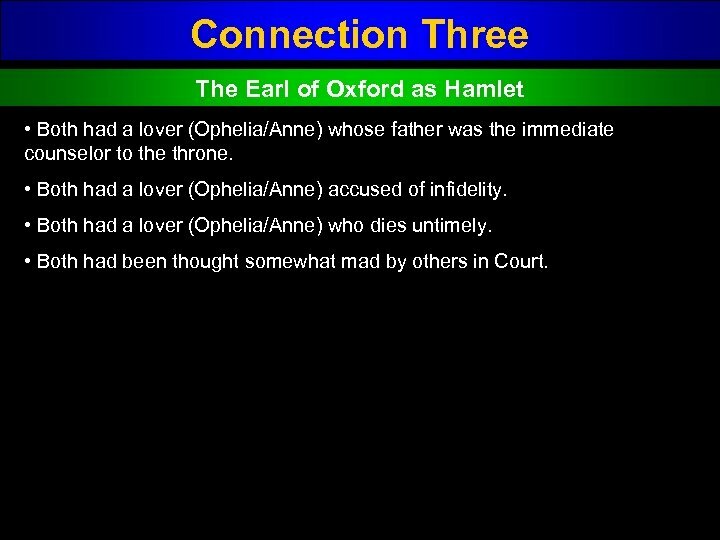 Connection Three The Earl of Oxford as Hamlet • Both had a lover (Ophelia/Anne) whose father was the immediate counselor to the throne. 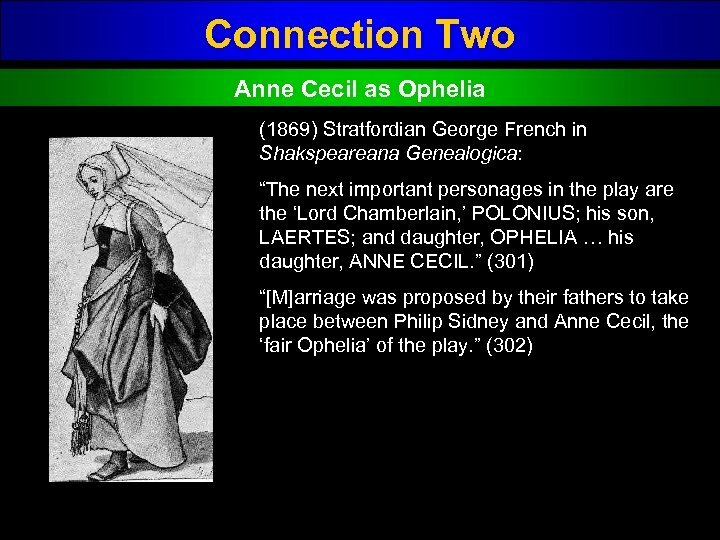 • Both had a lover (Ophelia/Anne) accused of infidelity. 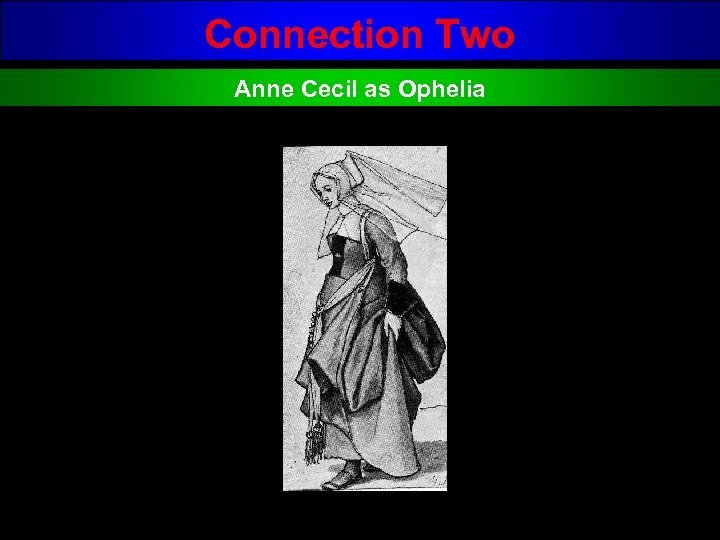 • Both had a lover (Ophelia/Anne) who dies untimely. 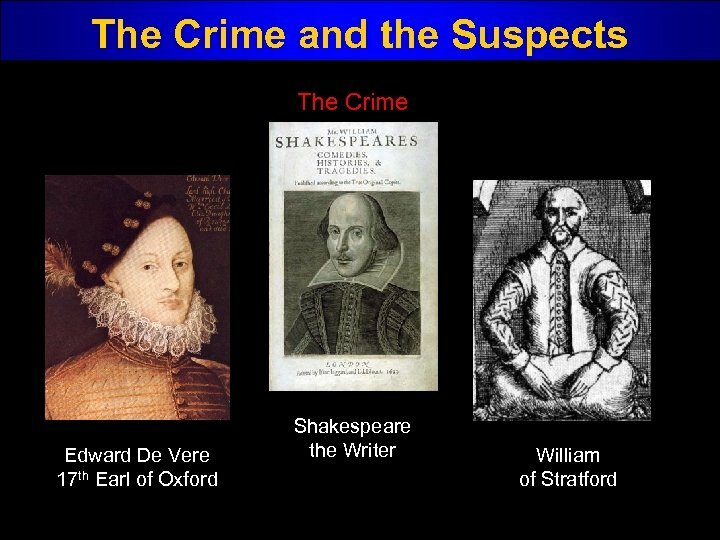 • Both had been thought somewhat mad by others in Court. 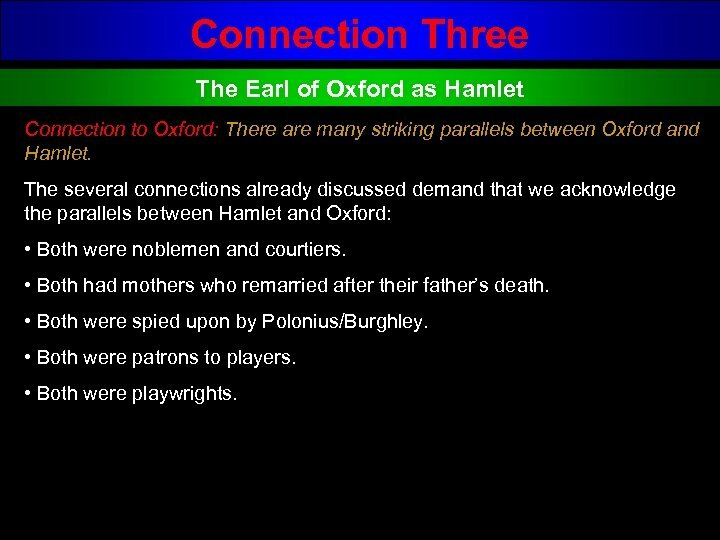 Connection Three The Earl of Oxford as Hamlet If Polonius is Burghley, and there is compelling reason to think that people at that time would have easily recognized him as such, then the further parallels between Laertes and Ophelia and Burghley’s offspring cement the identification, and compel us to look at who would then be Hamlet. 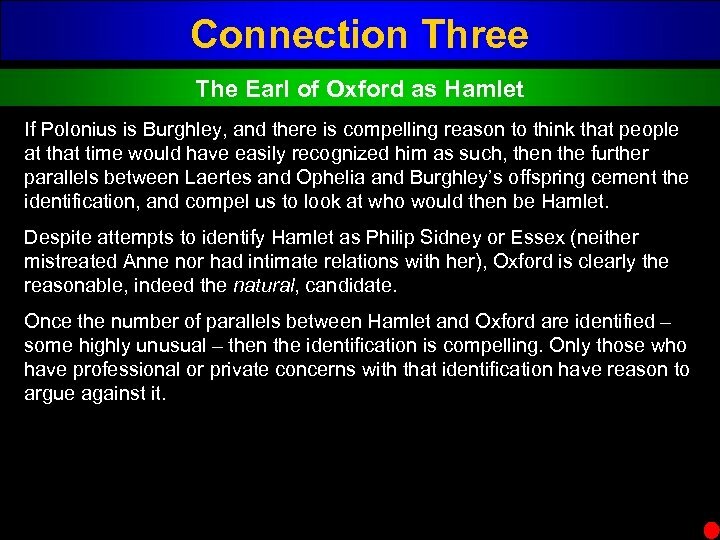 Despite attempts to identify Hamlet as Philip Sidney or Essex (neither mistreated Anne nor had intimate relations with her), Oxford is clearly the reasonable, indeed the natural, candidate. 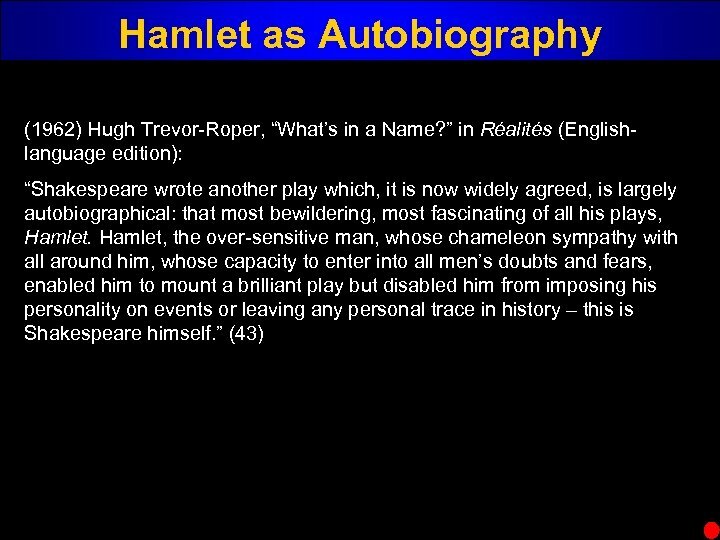 Once the number of parallels between Hamlet and Oxford are identified – some highly unusual – then the identification is compelling. Only those who have professional or private concerns with that identification have reason to argue against it. 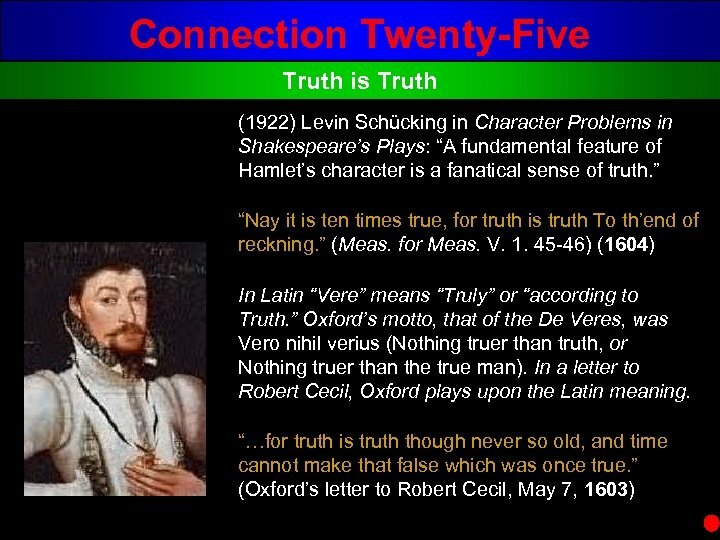 Connection Six Gad’s Hill Episode Henry IV, Part 1, Act I, Scene 2, 120 138: Poins. 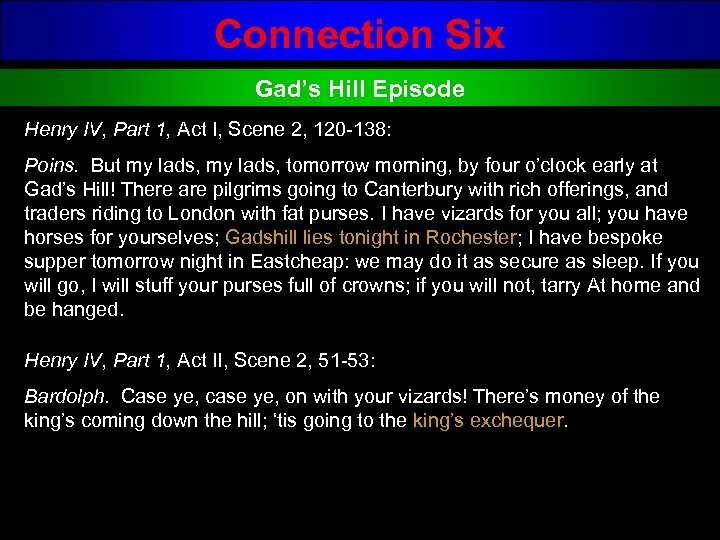 But my lads, tomorrow morning, by four o’clock early at Gad’s Hill! There are pilgrims going to Canterbury with rich offerings, and traders riding to London with fat purses. 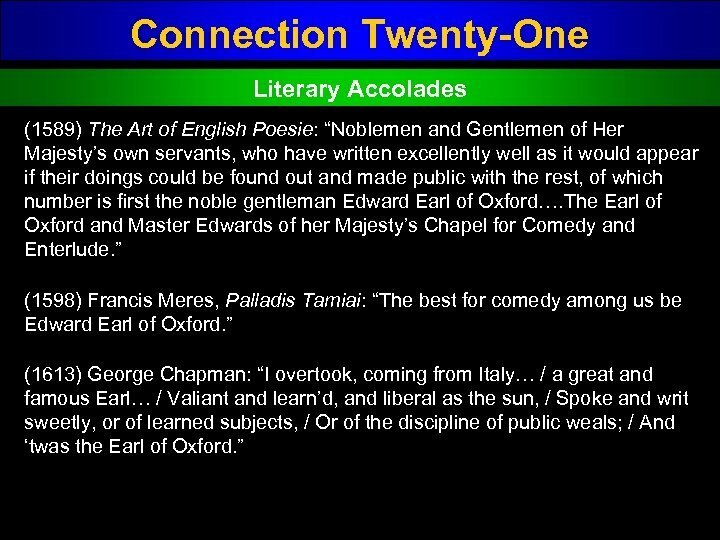 I have vizards for you all; you have horses for yourselves; Gadshill lies tonight in Rochester; I have bespoke supper tomorrow night in Eastcheap: we may do it as secure as sleep. 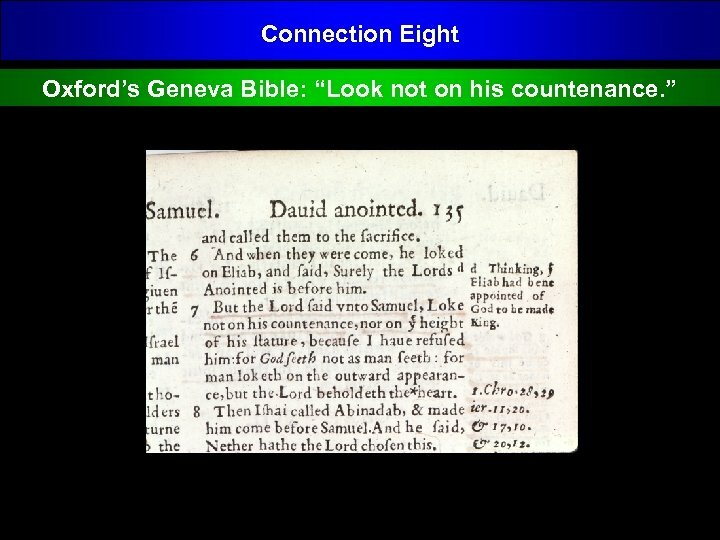 If you will go, I will stuff your purses full of crowns; if you will not, tarry At home and be hanged. 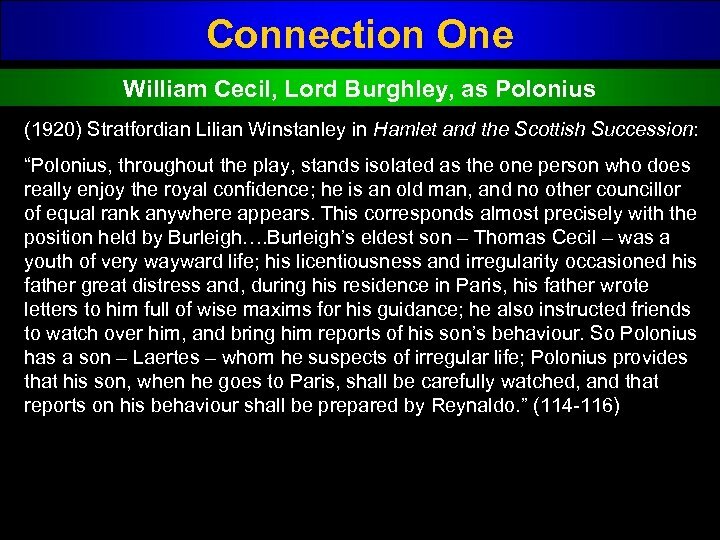 Henry IV, Part 1, Act II, Scene 2, 51 53: Bardolph. Case ye, case ye, on with your vizards! There’s money of the king’s coming down the hill; ‘tis going to the king’s exchequer. 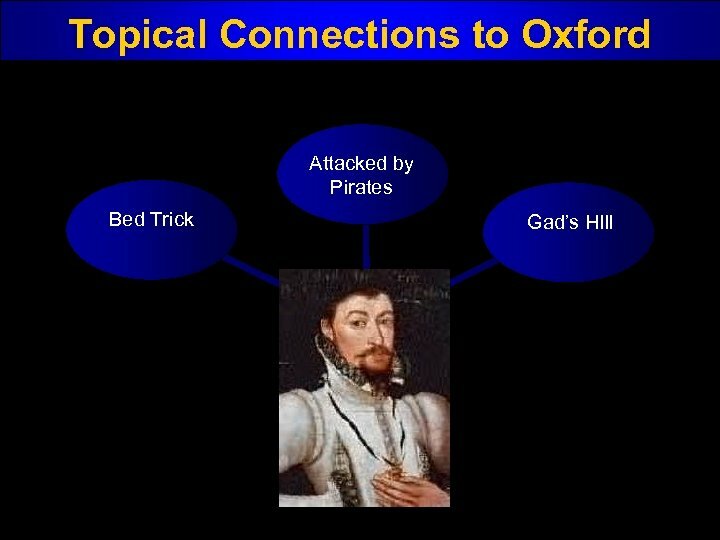 Connection Six Gad’s Hill Episode Connection to Oxford: In 1573 Oxford’s men, when the Earl was a young man like Prince Hal, conducted a similar prank in the same location. Gad’s Hill is located in Kent on the highway between Rochester and Gravesend. 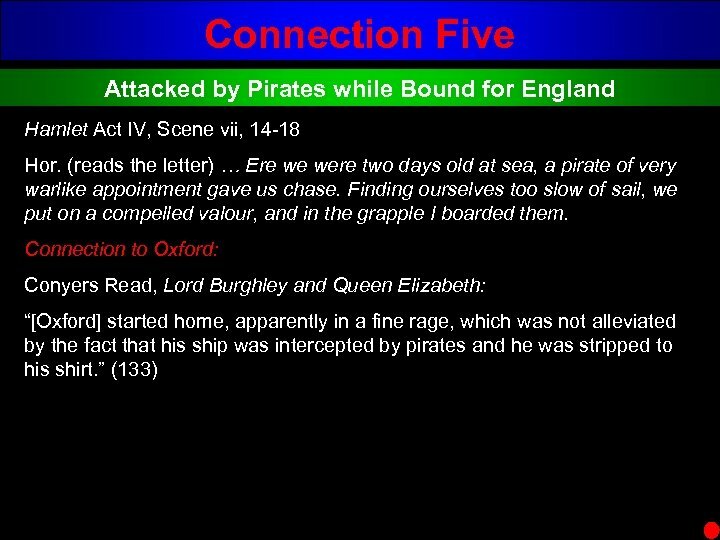 Letter to Lord Burghley dated May 1573 by William Fawnt and John Wotton, former associates of Oxford: “…Wootton and my self riding peaceably by the highway from Gravesend to Rochester, had three calivers charged with bullets, discharged at us by three of Lord Oxford’s men…who lay privily in a ditch awaiting our coming with full intent to murder us. 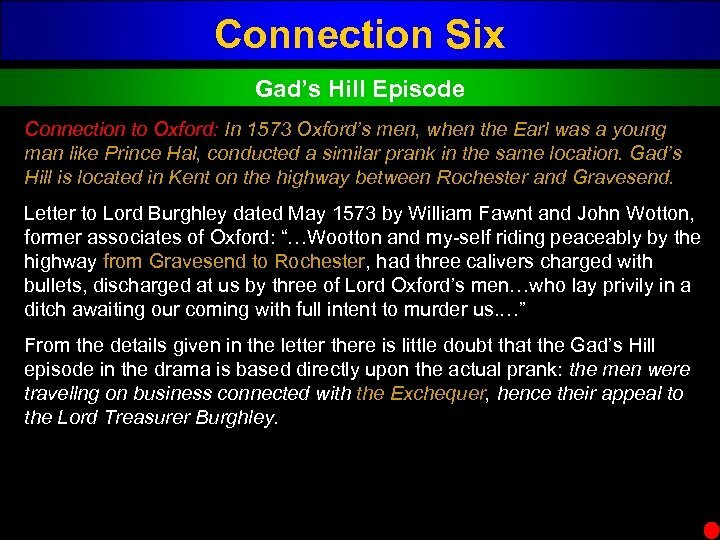 …” From the details given in the letter there is little doubt that the Gad’s Hill episode in the drama is based directly upon the actual prank: the men were travellng on business connected with the Exchequer, hence their appeal to the Lord Treasurer Burghley. 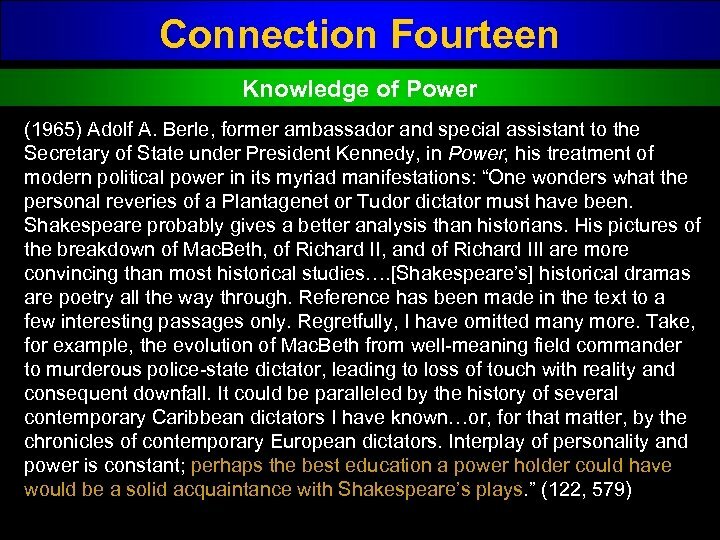 Connection to Shakspere ? 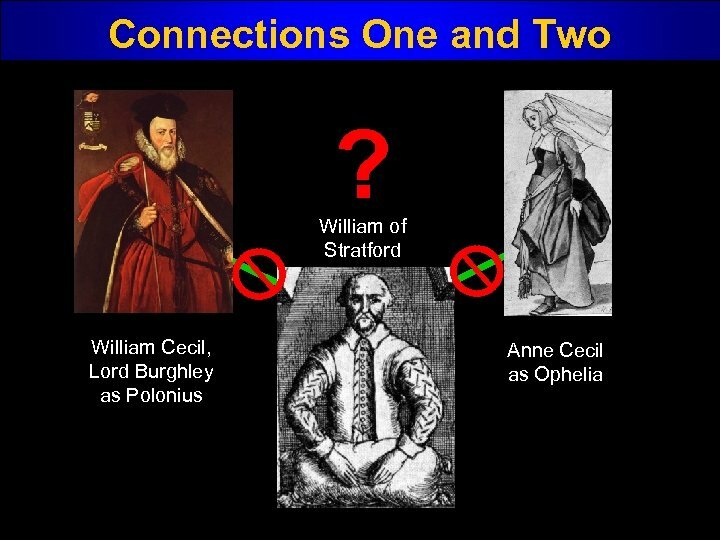 William of Stratford Topical connections? Uh…. 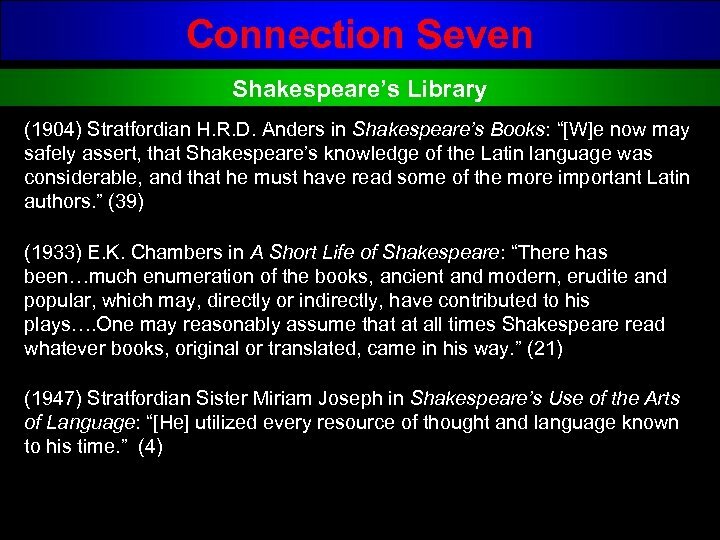 Connection to Shakspere ? 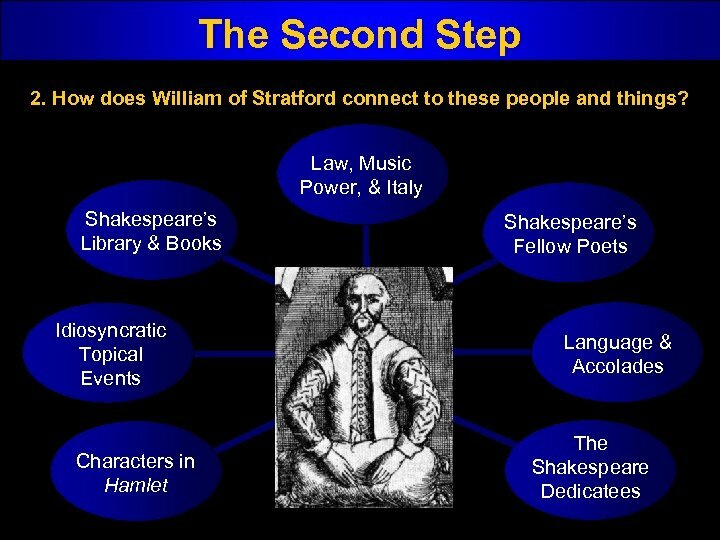 William of Stratford Shakespeare’s Library No known connection. 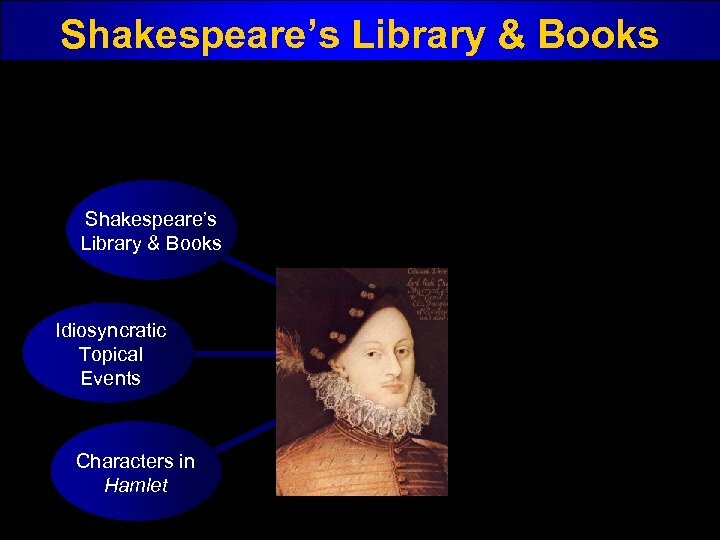 No evidence exists that William had a library, nor did he leave books in his will as others have done, in an age where books were so valuable they were chained to desks. 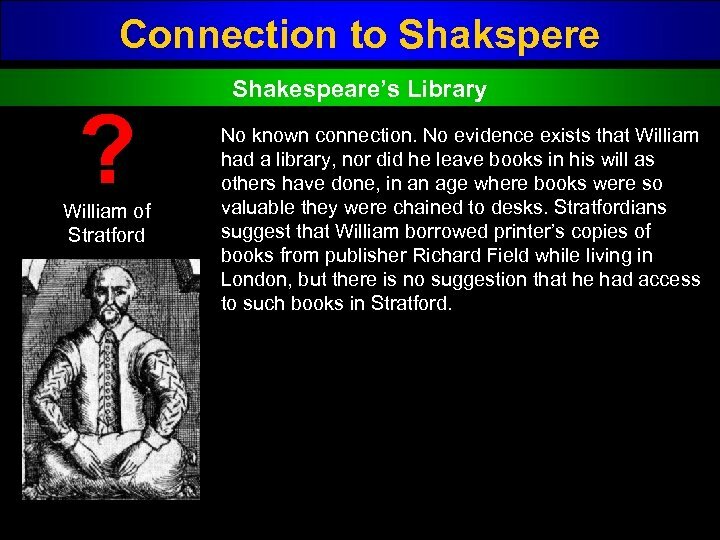 Stratfordians suggest that William borrowed printer’s copies of books from publisher Richard Field while living in London, but there is no suggestion that he had access to such books in Stratford. 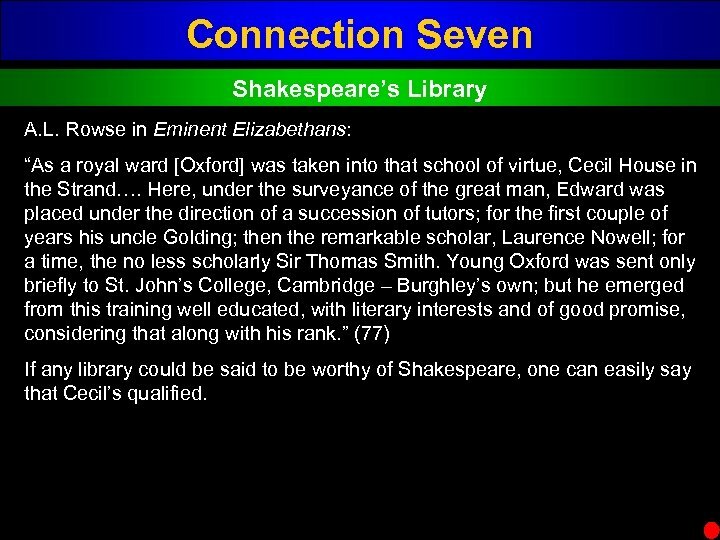 Connection Seven Shakespeare’s Library A. L. Rowse in Eminent Elizabethans: “As a royal ward [Oxford] was taken into that school of virtue, Cecil House in the Strand…. 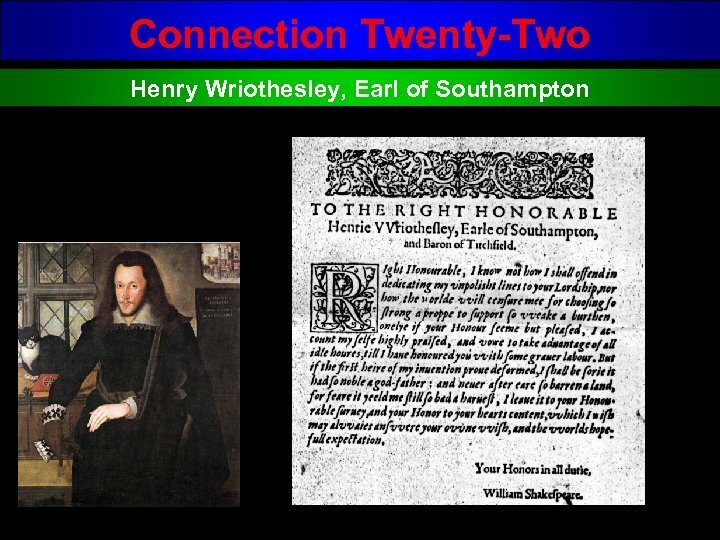 Here, under the surveyance of the great man, Edward was placed under the direction of a succession of tutors; for the first couple of years his uncle Golding; then the remarkable scholar, Laurence Nowell; for a time, the no less scholarly Sir Thomas Smith. 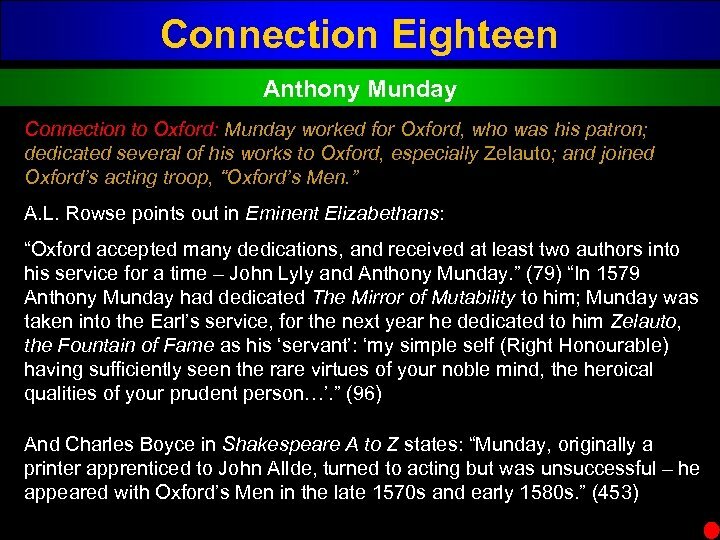 Young Oxford was sent only briefly to St. John’s College, Cambridge – Burghley’s own; but he emerged from this training well educated, with literary interests and of good promise, considering that along with his rank. 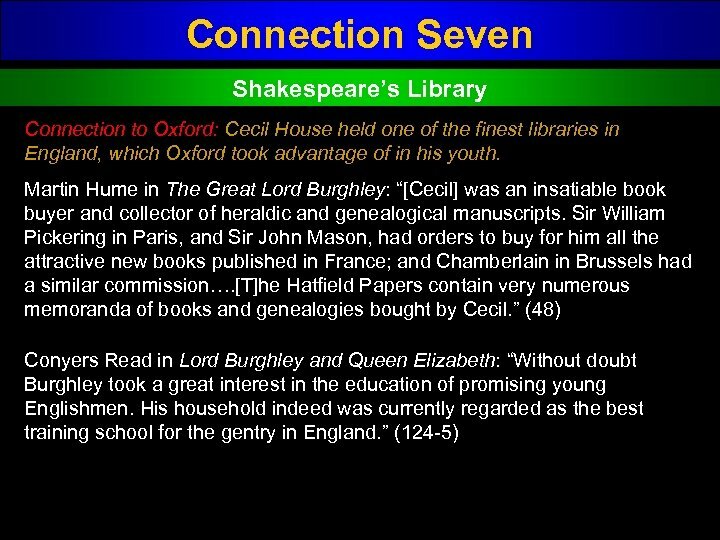 ” (77) If any library could be said to be worthy of Shakespeare, one can easily say that Cecil’s qualified. 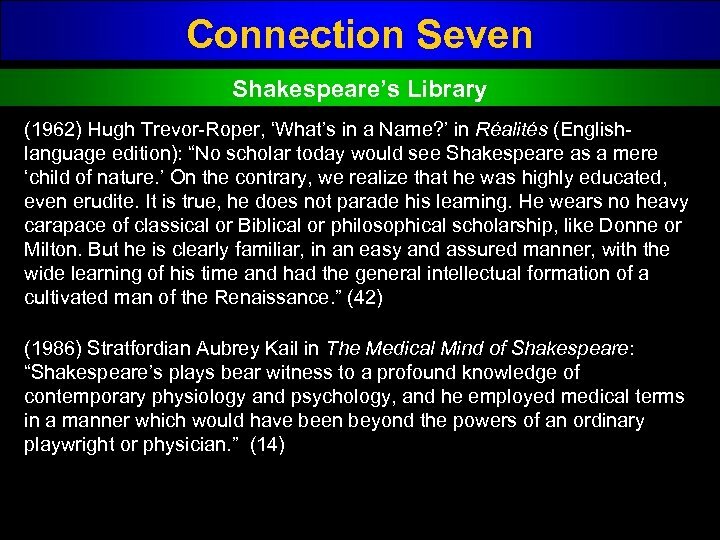 Connection to Shakspere ? 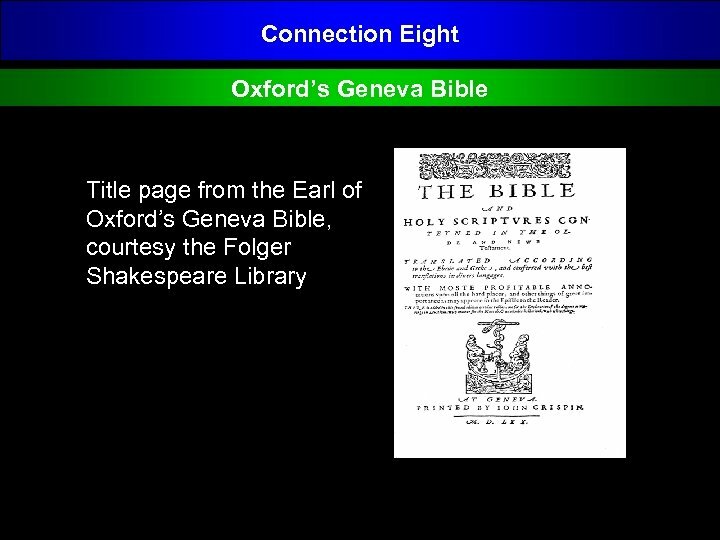 William of Stratford Geneva Bible No known connection. 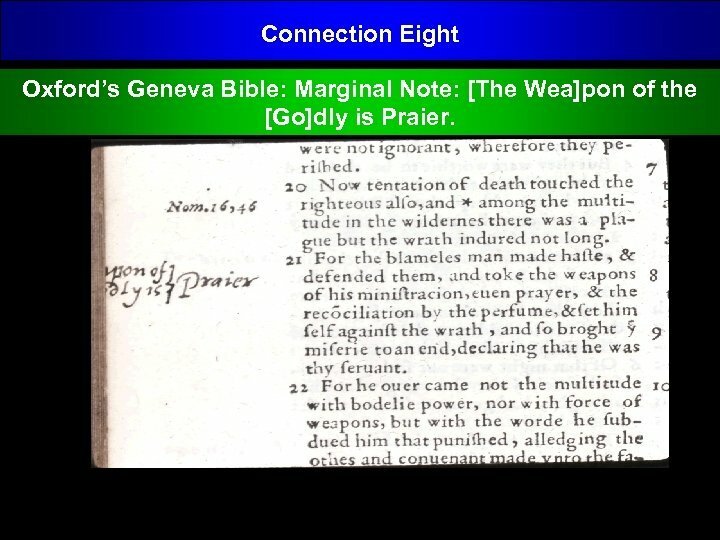 Connection Eight Oxford’s Geneva Bible: Marginal Note: [The Wea]pon of the [Go]dly is Praier. 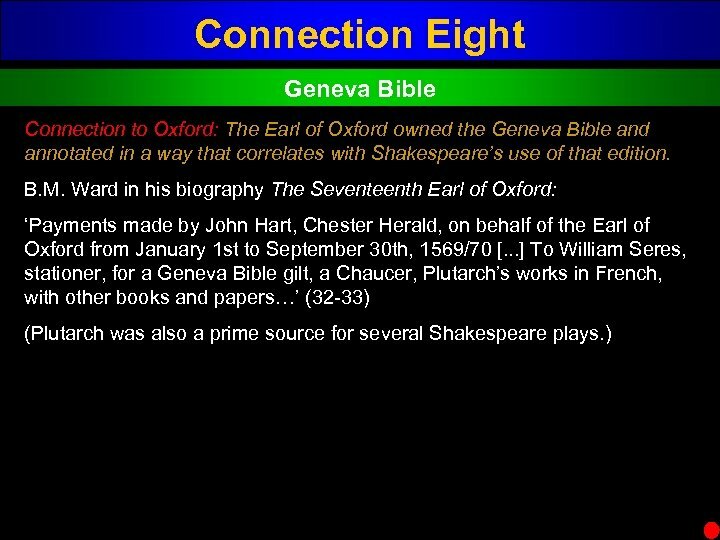 Connection Eight Oxford’s Geneva Bible: “Look not on his countenance. ” Nb. 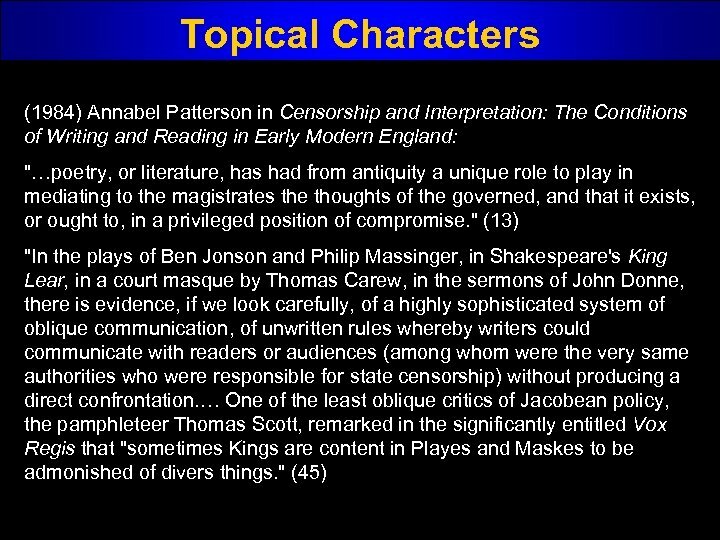 : These slides are illustrative, not argumentative. 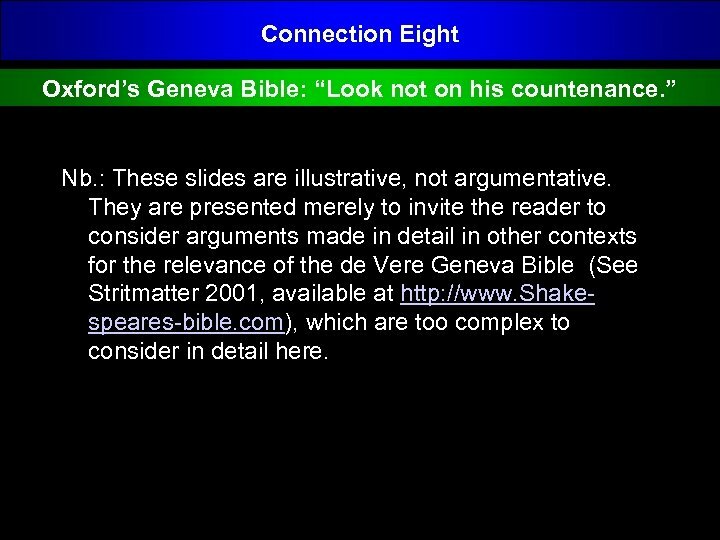 They are presented merely to invite the reader to consider arguments made in detail in other contexts for the relevance of the de Vere Geneva Bible (See Stritmatter 2001, available at http: //www. 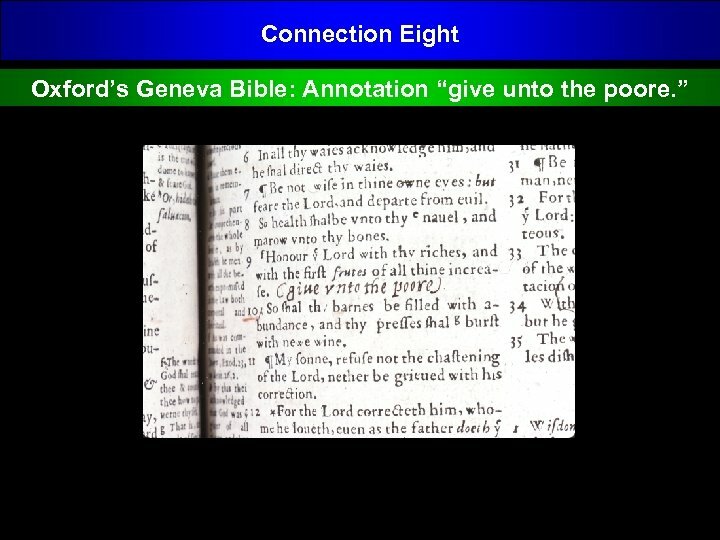 Shake speares bible. com), which are too complex to consider in detail here. 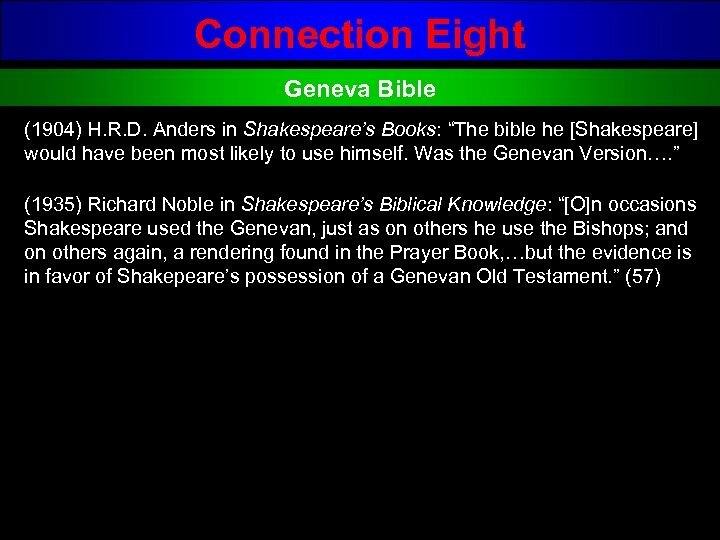 Connection to Shakspere ? 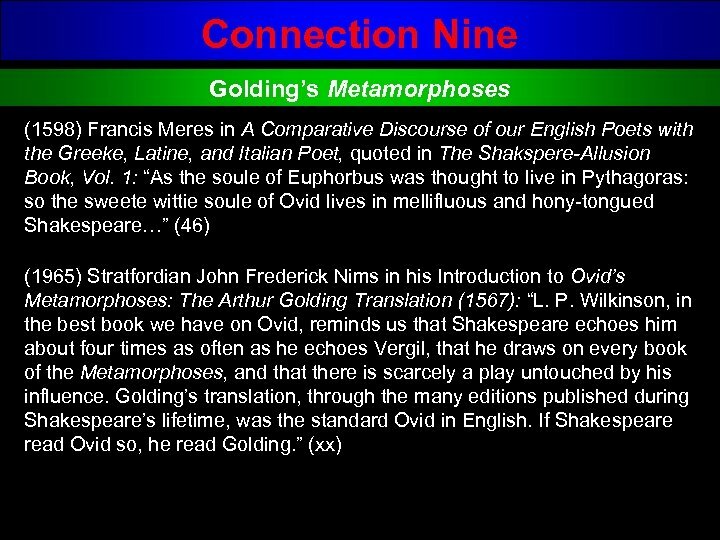 William of Stratford Golding’s Metamorphoses No known connection. Orthodox scholars speculate that William read Golding at the Stratford Grammar School, but there is no record that William attended this school. 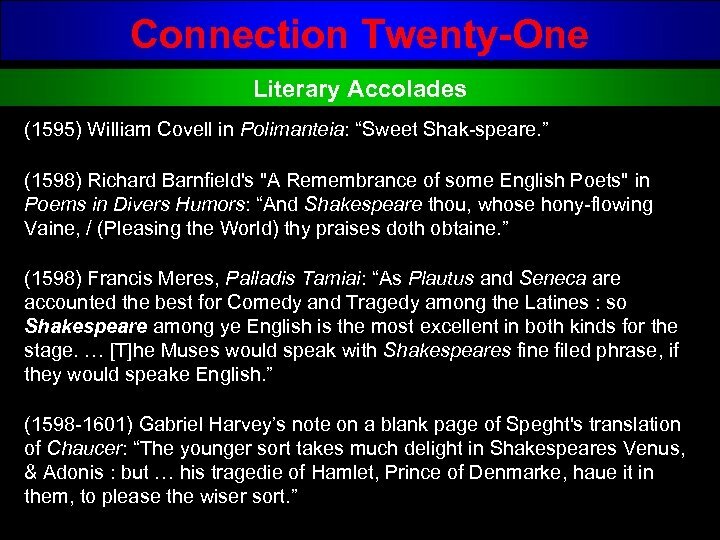 Connection to Shakspere ? 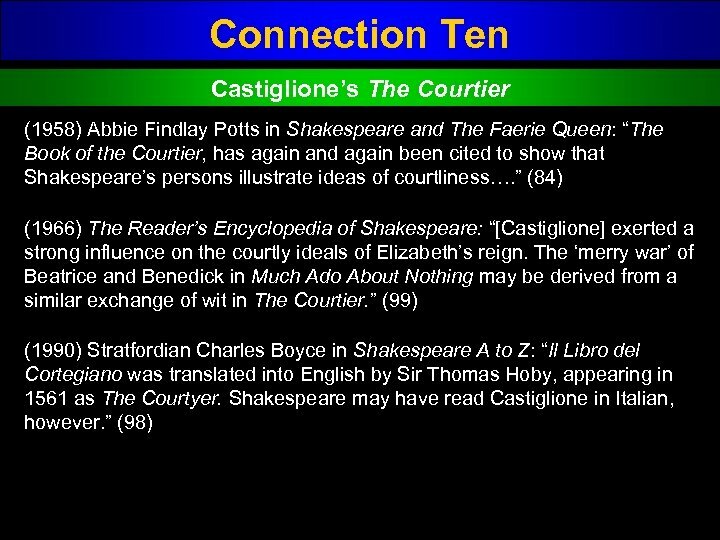 William of Stratford Castiglione’s The Courtier No known connection. 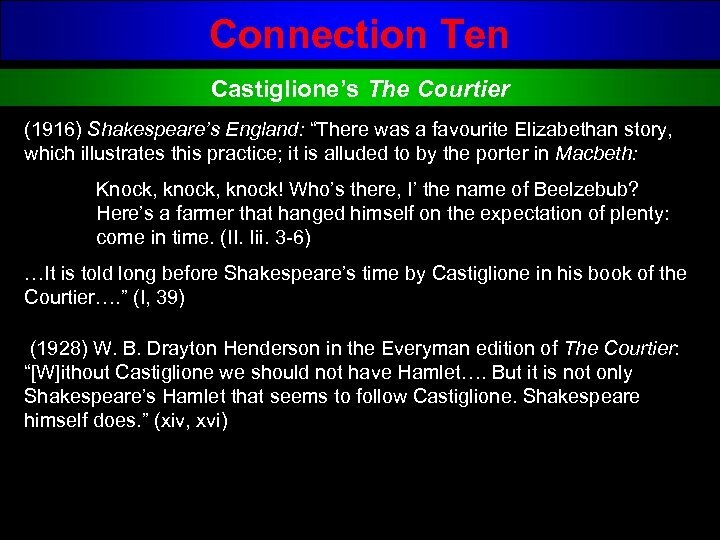 Connection Ten Castiglione’s The Courtier …art than I can lay claim to, the second to be a work of no less good will and application. To do both, however, seemed to combine a task of delightful industry with an indication of special good will. 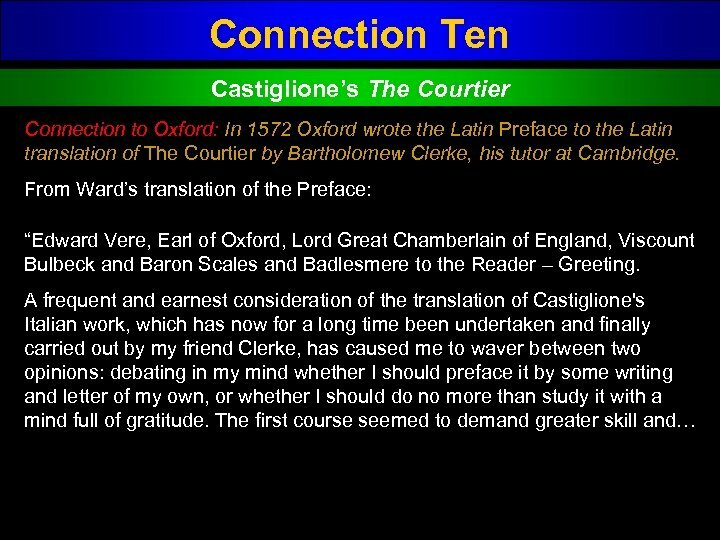 I have therefore undertaken the work, and I do so the more willingly, in order that I may lay a laurel wreath of my own on the translation in which I have studied this book, and also to ensure that neither my good will (which is very great) should remain unexpressed, nor that my skill (which is small) should seem to fear to face the light and the eyes of men. 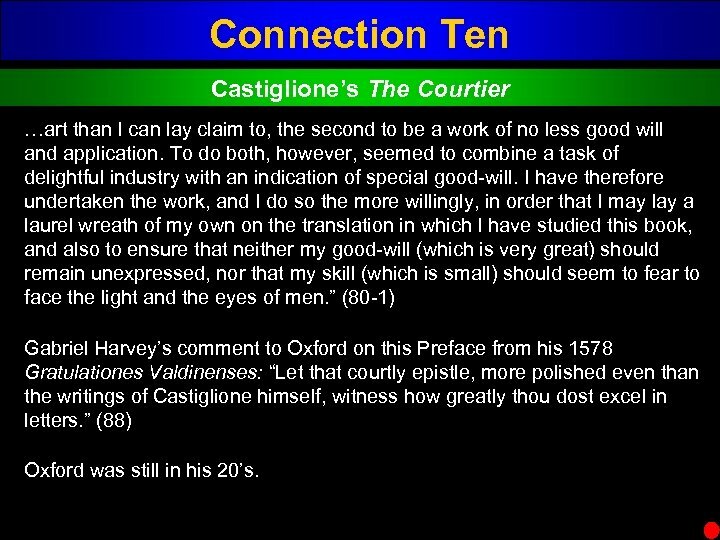 ” (80 1) Gabriel Harvey’s comment to Oxford on this Preface from his 1578 Gratulationes Valdinenses: “Let that courtly epistle, more polished even than the writings of Castiglione himself, witness how greatly thou dost excel in letters. 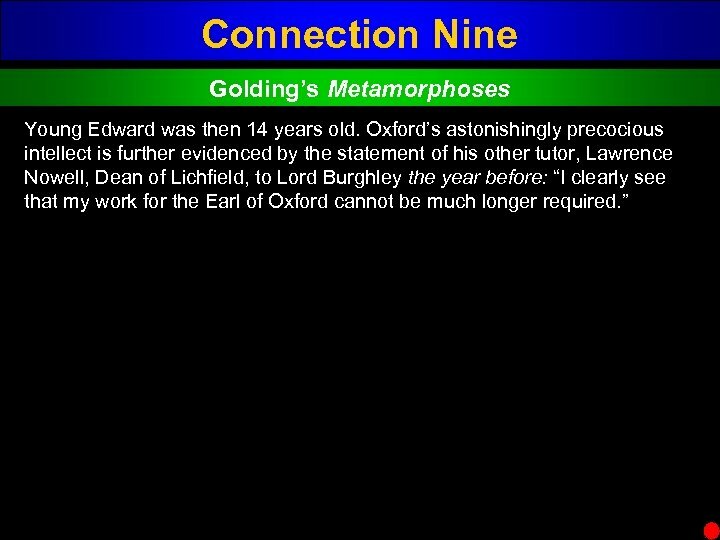 ” (88) Oxford was still in his 20’s. 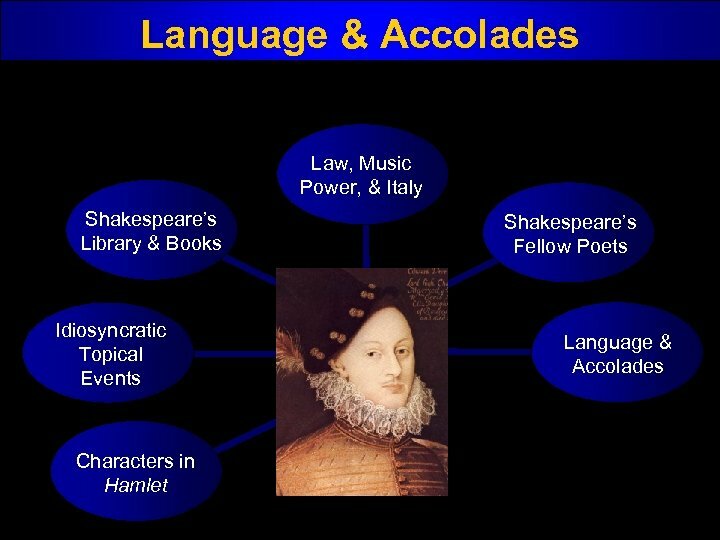 Connection to Shakspere ? William of Stratford Cardan’s Comforte No known connection. 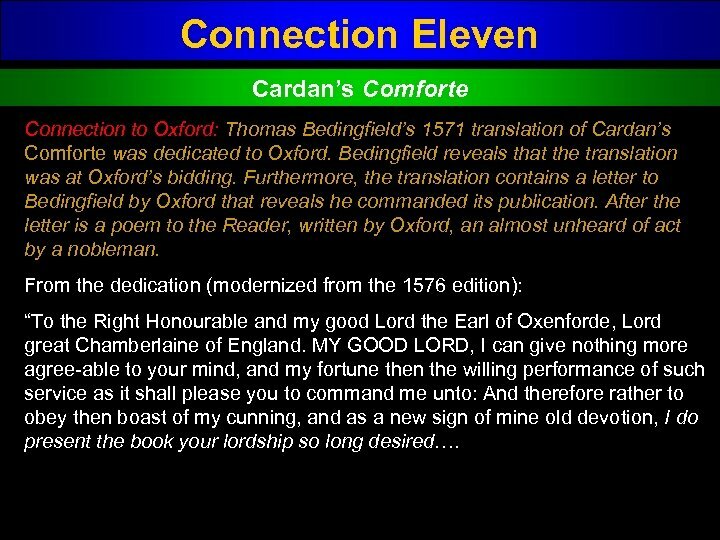 Connection Eleven Cardan’s Comforte Connection to Oxford: Thomas Bedingfield’s 1571 translation of Cardan’s Comforte was dedicated to Oxford. 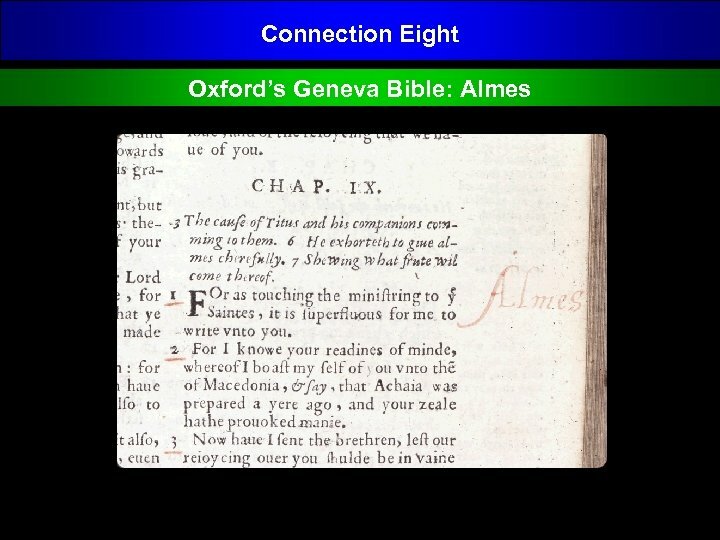 Bedingfield reveals that the translation was at Oxford’s bidding. 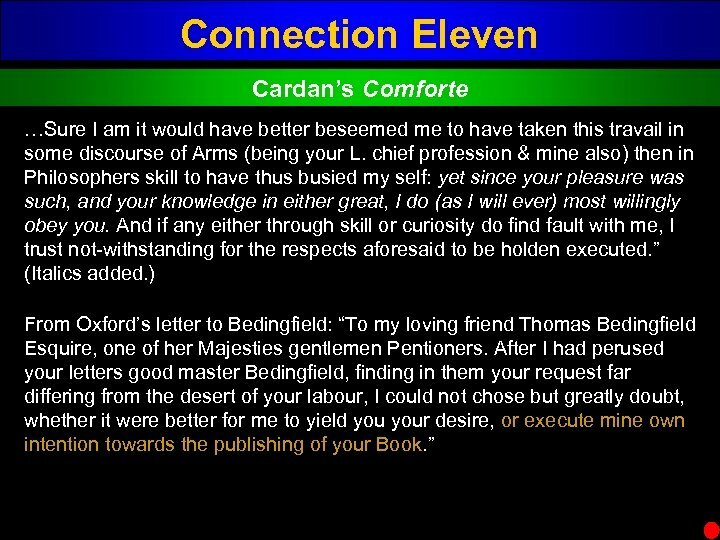 Furthermore, the translation contains a letter to Bedingfield by Oxford that reveals he commanded its publication. 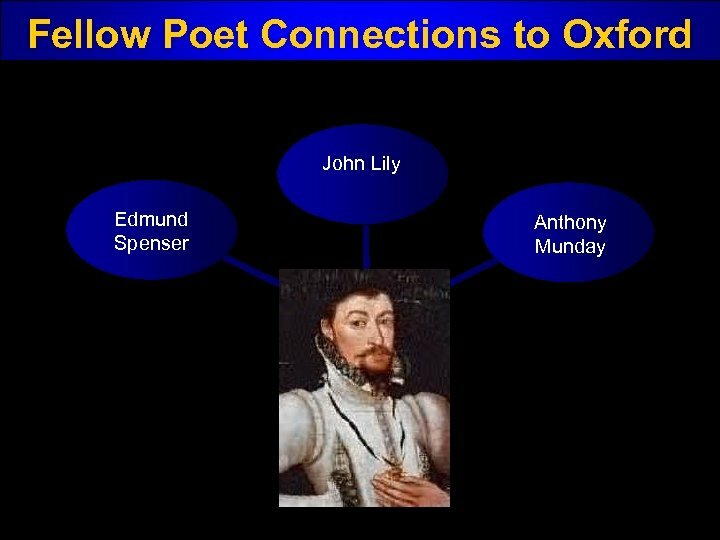 After the letter is a poem to the Reader, written by Oxford, an almost unheard of act by a nobleman. 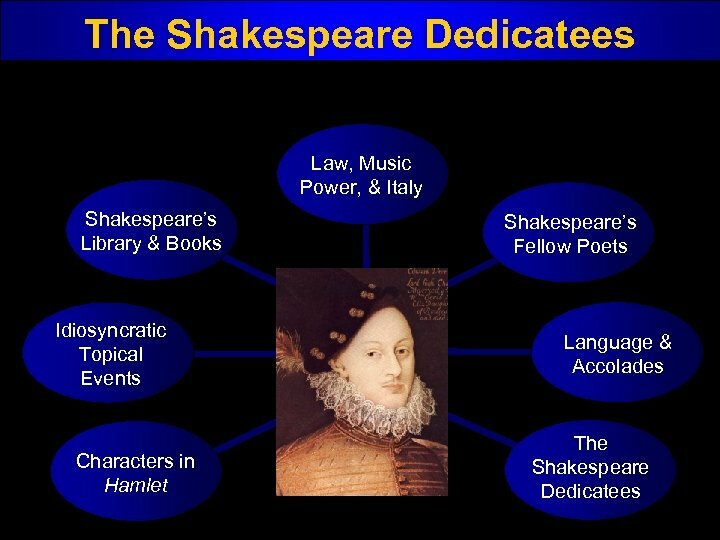 From the dedication (modernized from the 1576 edition): “To the Right Honourable and my good Lord the Earl of Oxenforde, Lord great Chamberlaine of England. MY GOOD LORD, I can give nothing more agree able to your mind, and my fortune then the willing performance of such service as it shall please you to command me unto: And therefore rather to obey then boast of my cunning, and as a new sign of mine old devotion, I do present the book your lordship so long desired…. 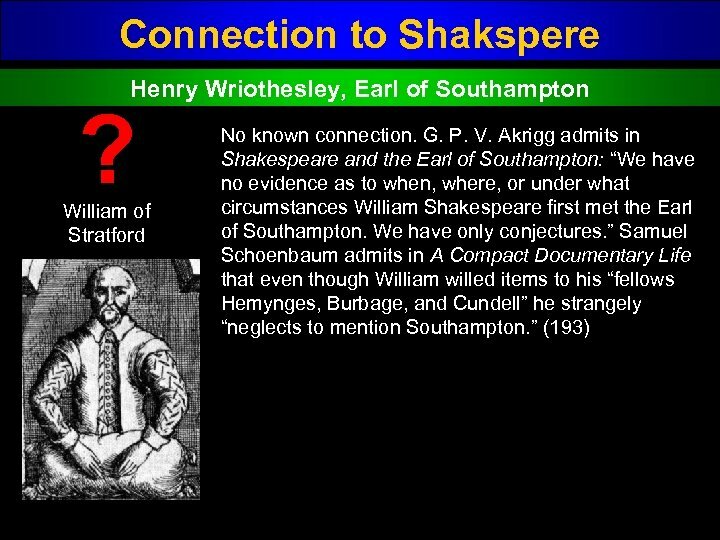 Connection to Shakspere ? 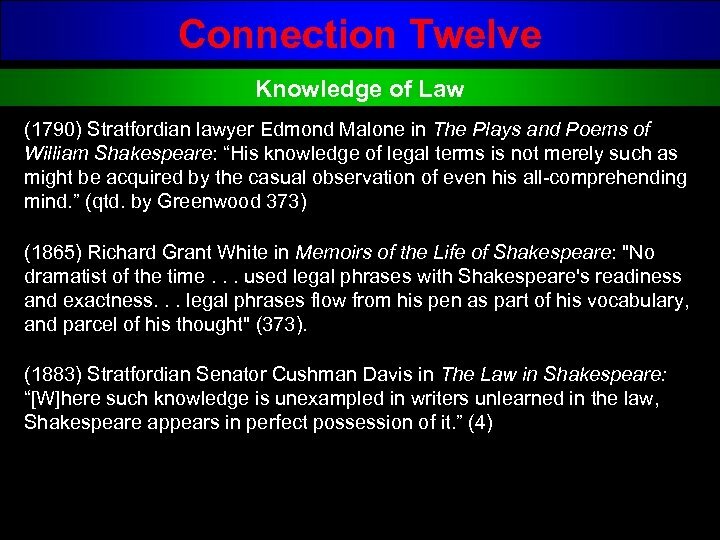 William of Stratford Knowledge of Law No known connection. The record shows that William had some experience with lawsuits and property, but no record shows that William attended or was associated with Gray’s Inn, or engaged in legal activity as a lawyer. 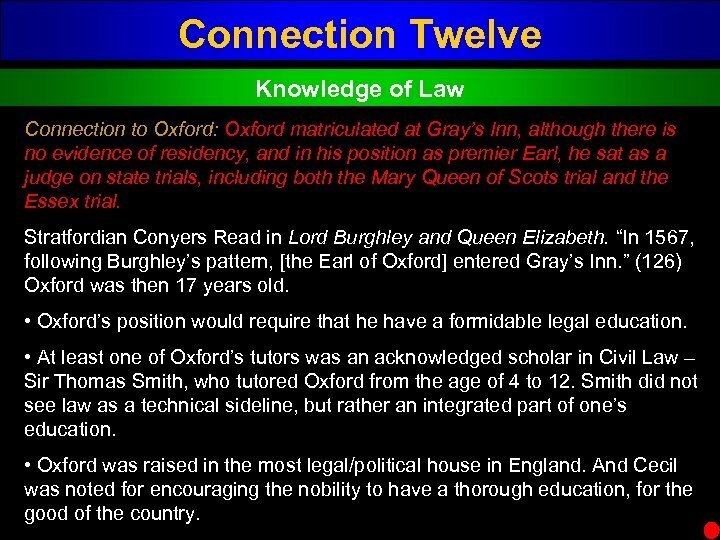 Connection Twelve Knowledge of Law Connection to Oxford: Oxford matriculated at Gray’s Inn, although there is no evidence of residency, and in his position as premier Earl, he sat as a judge on state trials, including both the Mary Queen of Scots trial and the Essex trial. 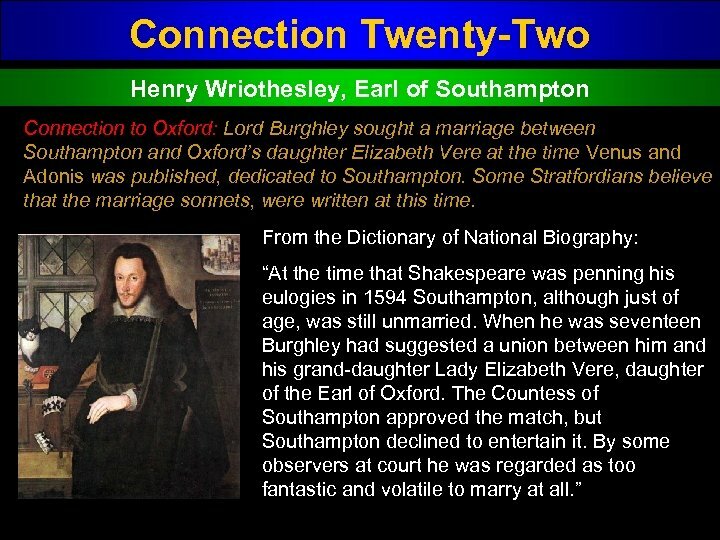 Stratfordian Conyers Read in Lord Burghley and Queen Elizabeth. 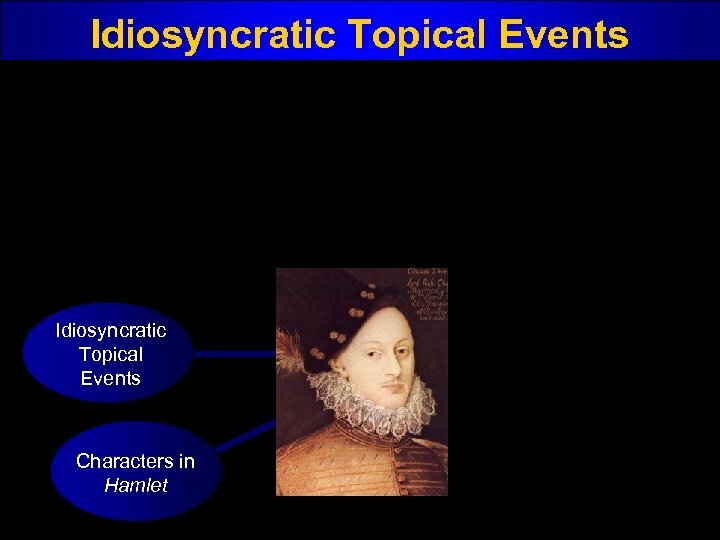 “In 1567, following Burghley’s pattern, [the Earl of Oxford] entered Gray’s Inn. 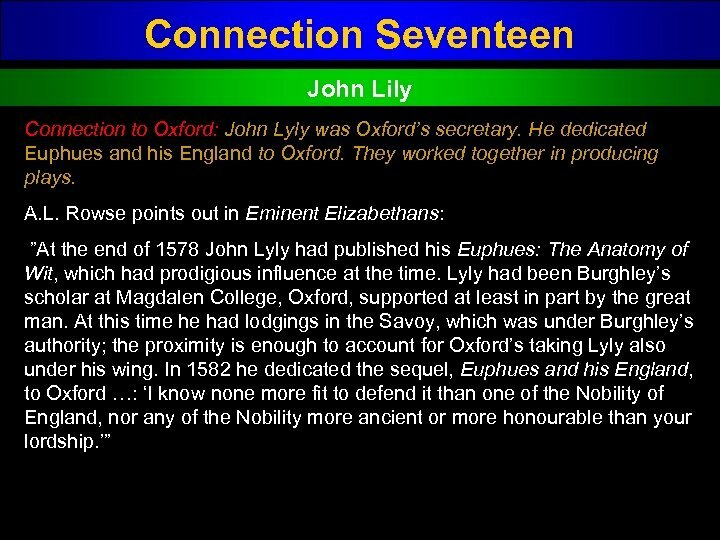 ” (126) Oxford was then 17 years old. 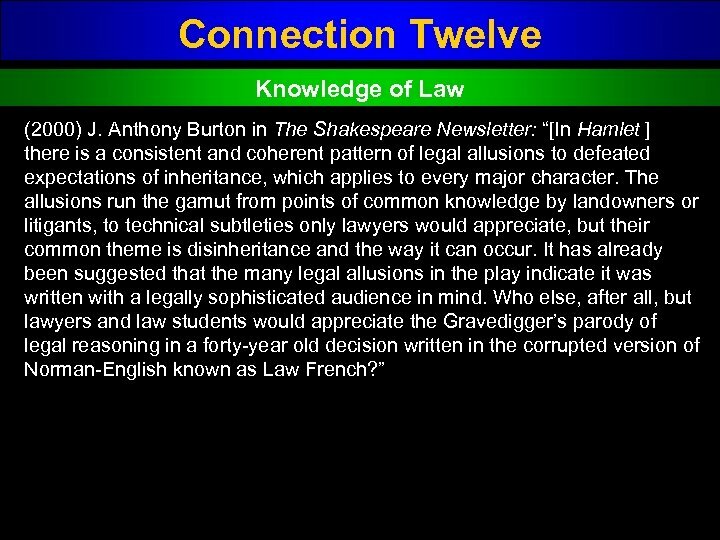 • Oxford’s position would require that he have a formidable legal education. 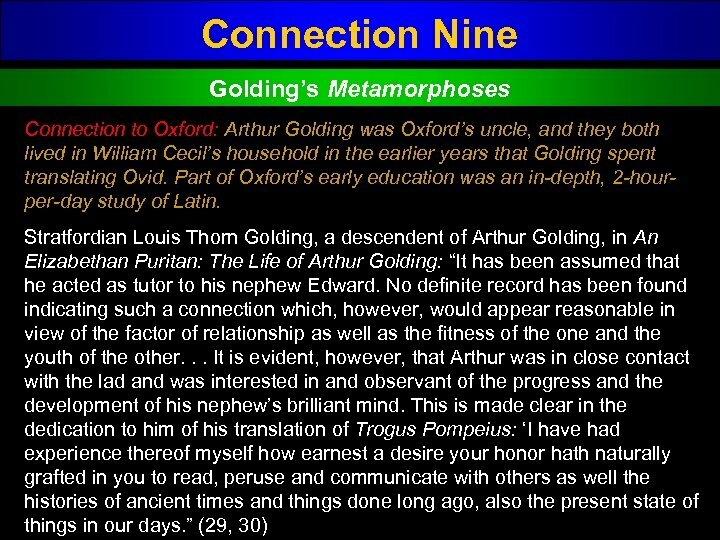 • At least one of Oxford’s tutors was an acknowledged scholar in Civil Law – Sir Thomas Smith, who tutored Oxford from the age of 4 to 12. 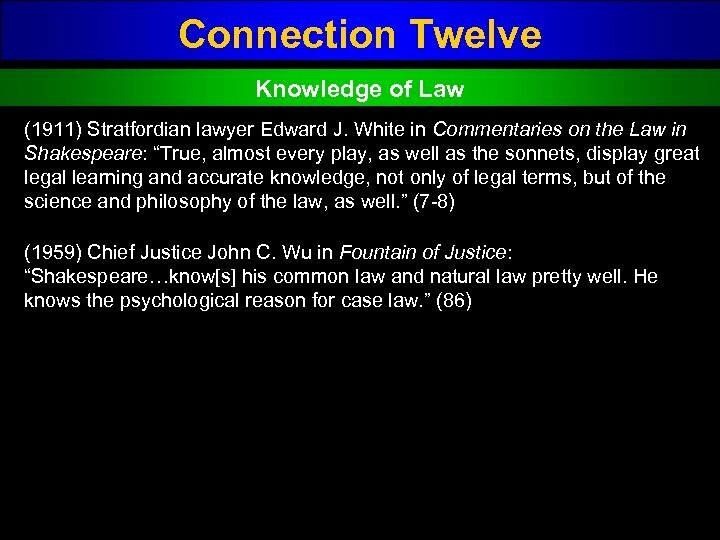 Smith did not see law as a technical sideline, but rather an integrated part of one’s education. 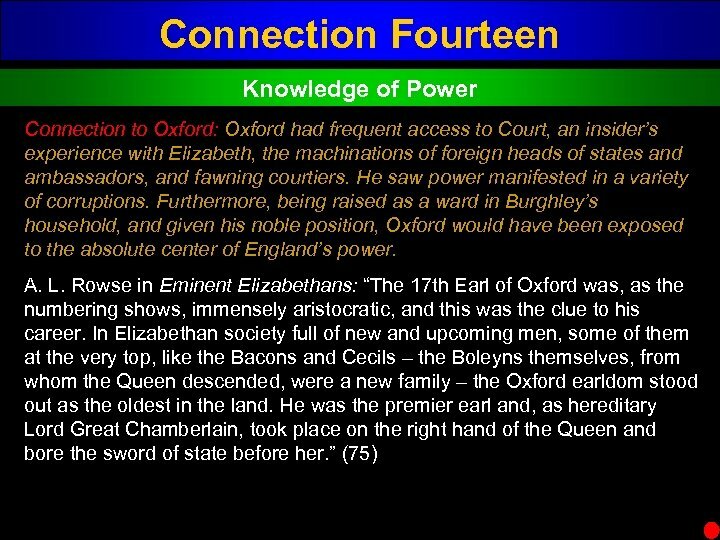 • Oxford was raised in the most legal/political house in England. 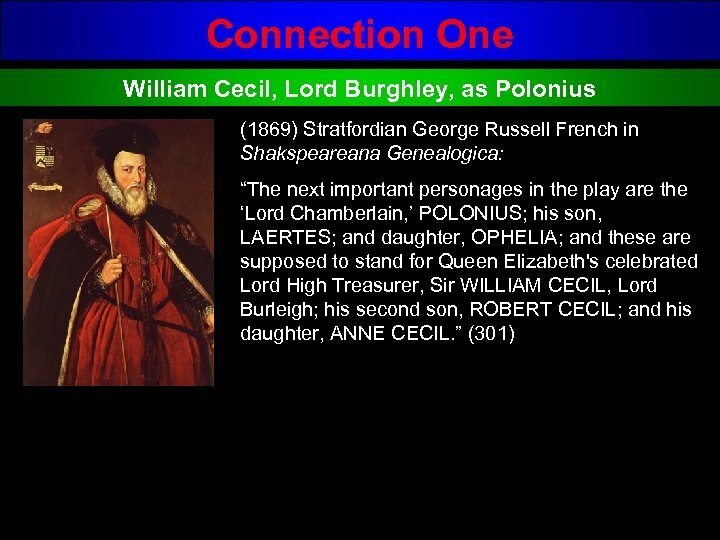 And Cecil was noted for encouraging the nobility to have a thorough education, for the good of the country. 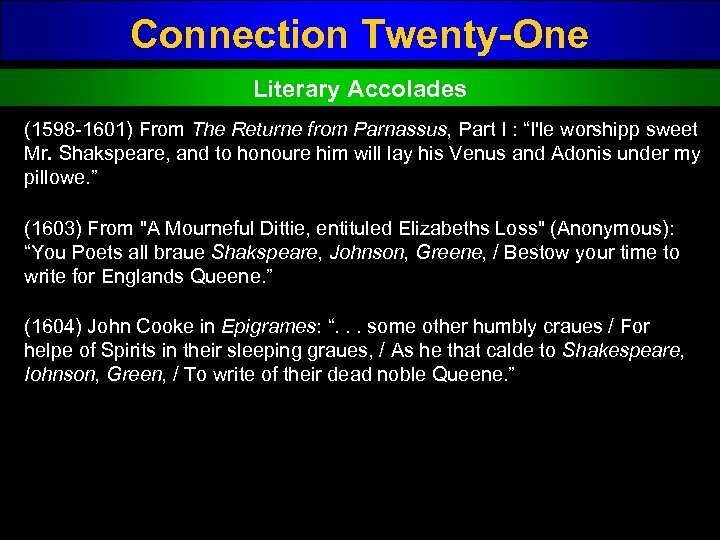 Connection to Shakspere ? 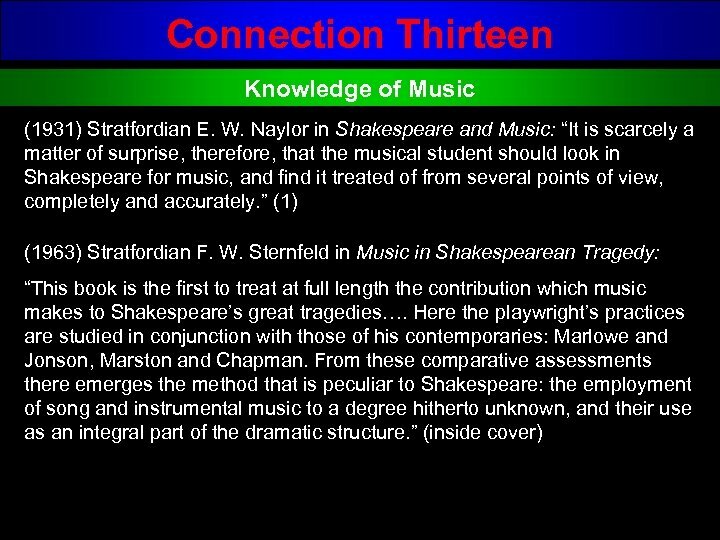 William of Stratford Knowledge of Music No known connection. 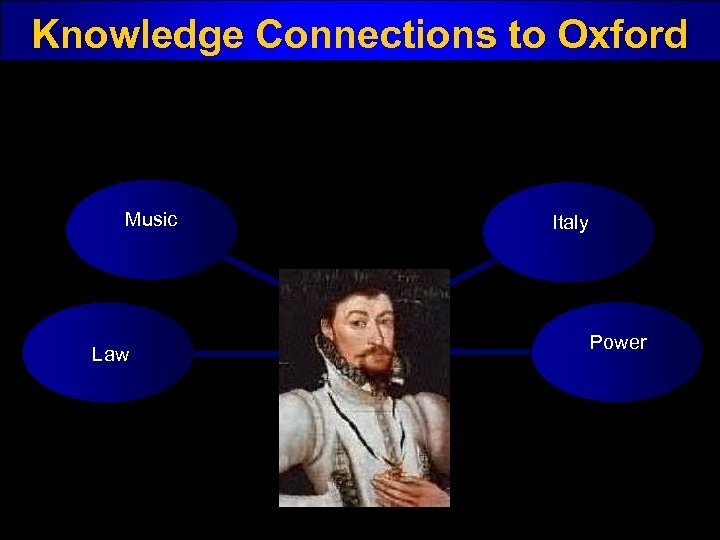 Connection Thirteen Knowledge of Music Connection to Oxford: Oxford was known as an accomplished musician and patron of music. 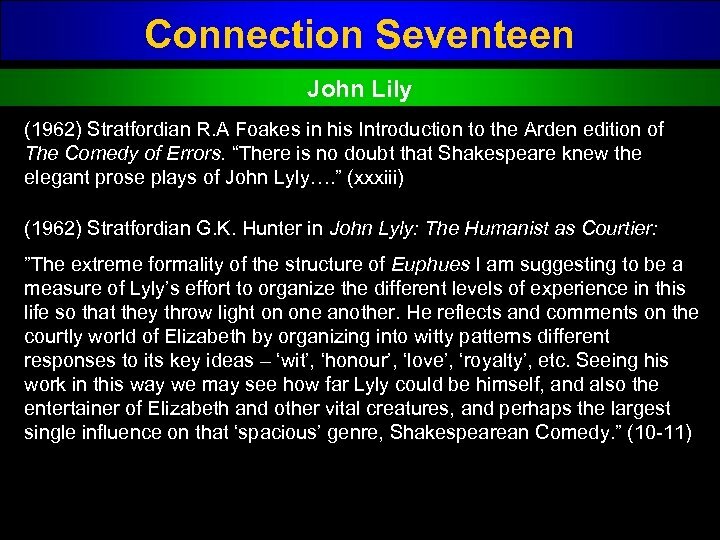 John Farmer dedicated two music books to him. Two musical works bearing his name, The Earl of Oxford’s March and The Earl of Oxford’s Galliard, may have been composed by him. 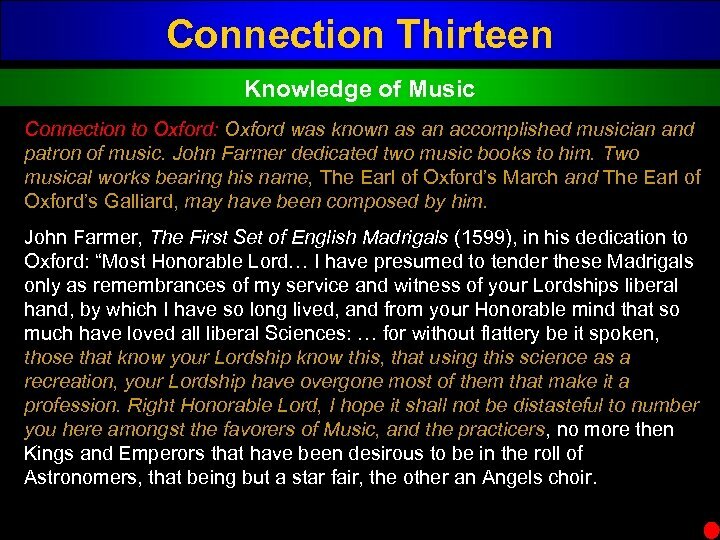 John Farmer, The First Set of English Madrigals (1599), in his dedication to Oxford: “Most Honorable Lord… I have presumed to tender these Madrigals only as remembrances of my service and witness of your Lordships liberal hand, by which I have so long lived, and from your Honorable mind that so much have loved all liberal Sciences: … for without flattery be it spoken, those that know your Lordship know this, that using this science as a recreation, your Lordship have overgone most of them that make it a profession. 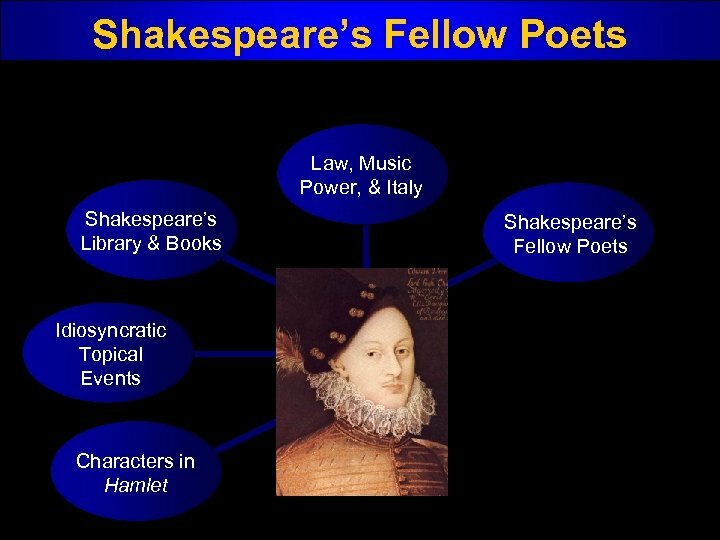 Right Honorable Lord, I hope it shall not be distasteful to number you here amongst the favorers of Music, and the practicers, no more then Kings and Emperors that have been desirous to be in the roll of Astronomers, that being but a star fair, the other an Angels choir. Connection to Shakspere ? William of Stratford Knowledge of Power No known connection. 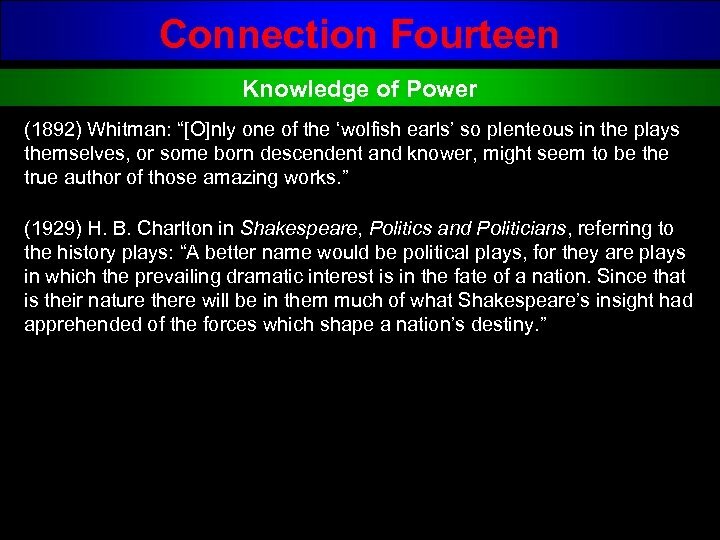 He is never mentioned in the company of power holders or being present in Court. 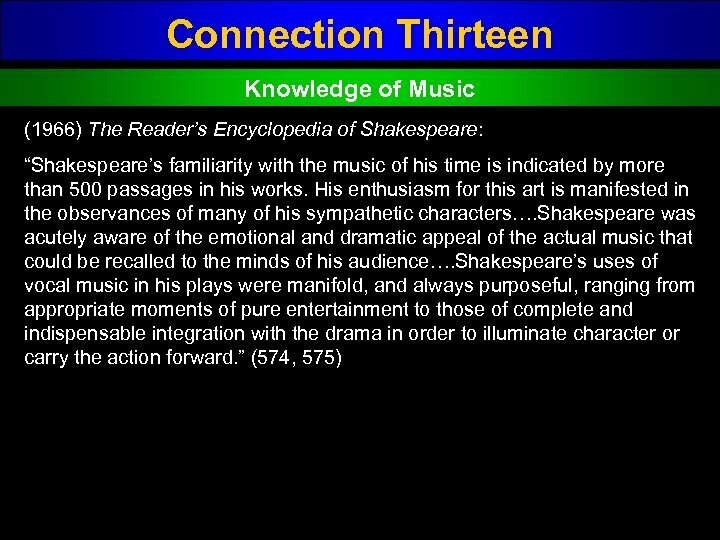 Connection to Shakspere ? 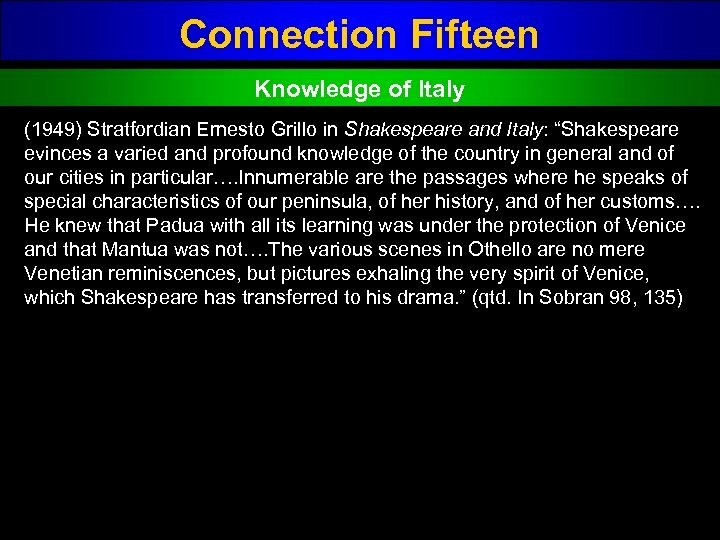 William of Stratford Knowledge of Italy No known connection. Orthodox scholars now doubt that he ever left England. 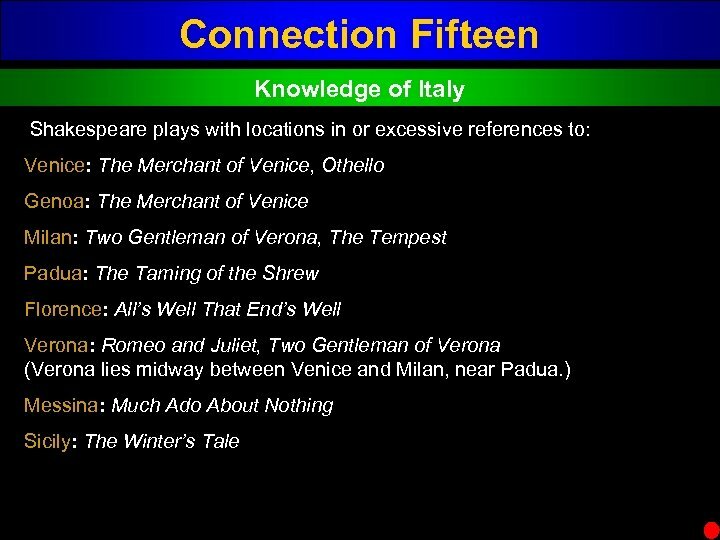 Connection Fifteen Knowledge of Italy Connection to Oxford: Of the 16 months Oxford traveled the continent, 10 were spent in Upper Italy, primarily in Venice, Padua, Milan, and Florence. 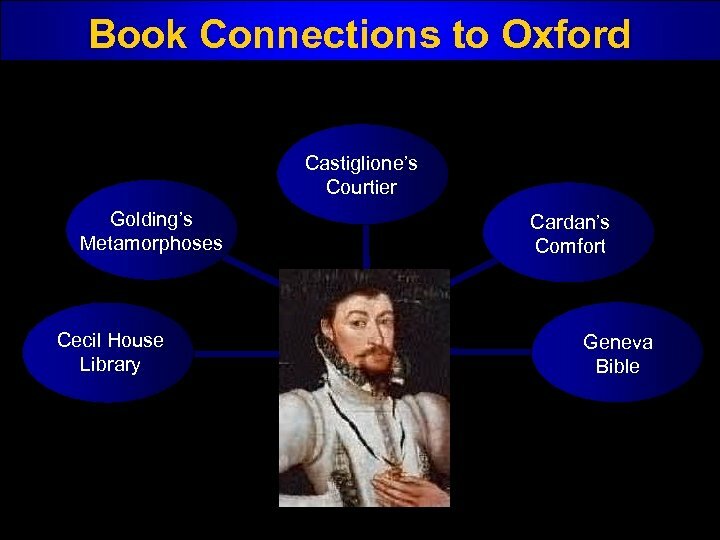 Alan H. Nelson, Professor of English at the University of California, Berkeley, supplies Oxford’s itinerary on his web site: Oxford first arrived in Venice in May 1575, made it the base of his operations, and interrupted his stay on at least three different occasions: • Between May and 23 September, when he visited Genoa and Milan (also Palermo, Sicily? ) Oxford was back in Venice on 23 September. • On 27 November, when he visited Padua. 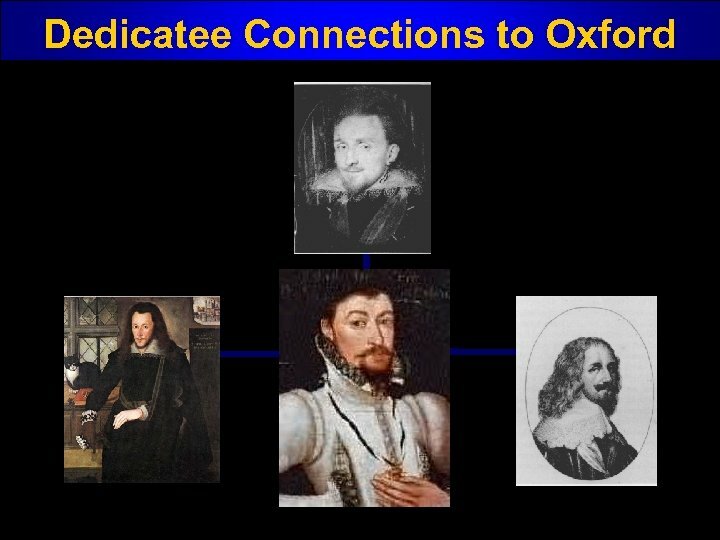 Oxford was in back Venice on 11 December. • Between 12 December and 26 February 1576, when he visited Florence and Siena (he was in the latter city on 3 January). 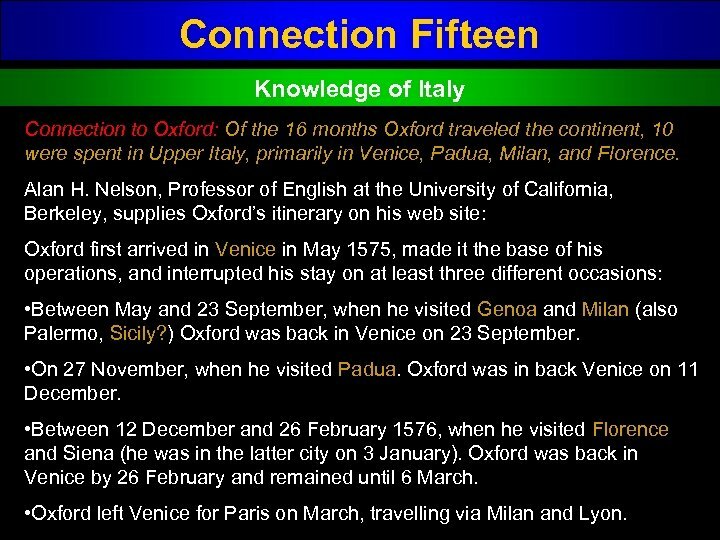 Oxford was back in Venice by 26 February and remained until 6 March. 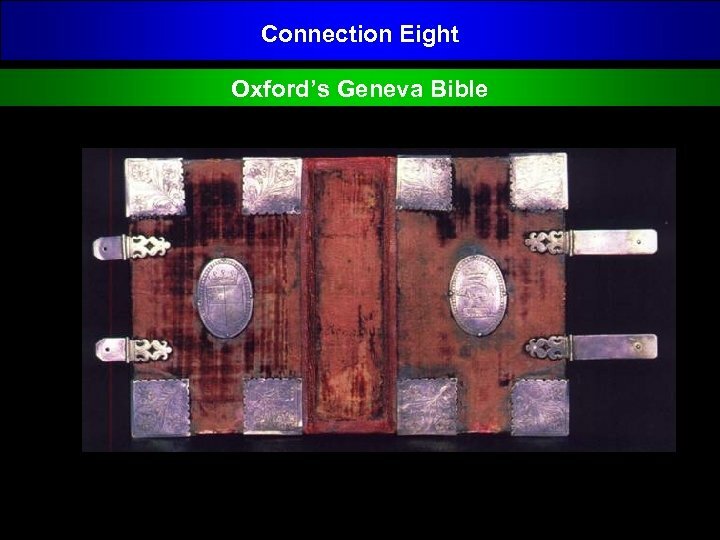 • Oxford left Venice for Paris on March, travelling via Milan and Lyon. 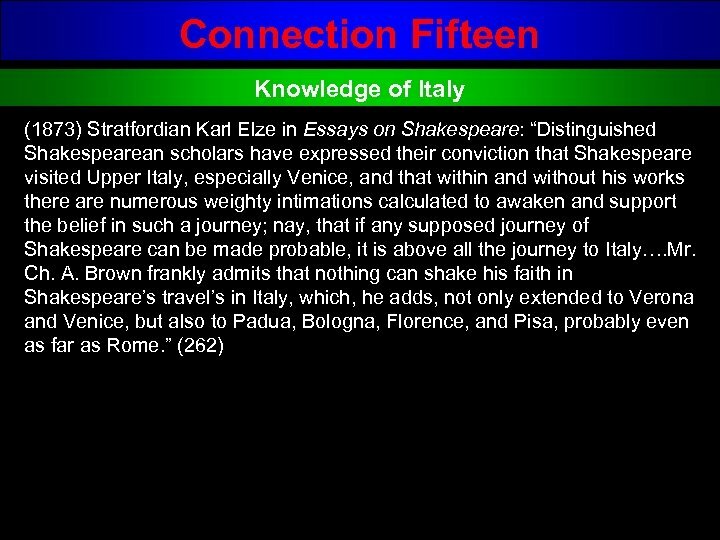 Connection to Shakspere ? William of Stratford Edmund Spenser No known connection. 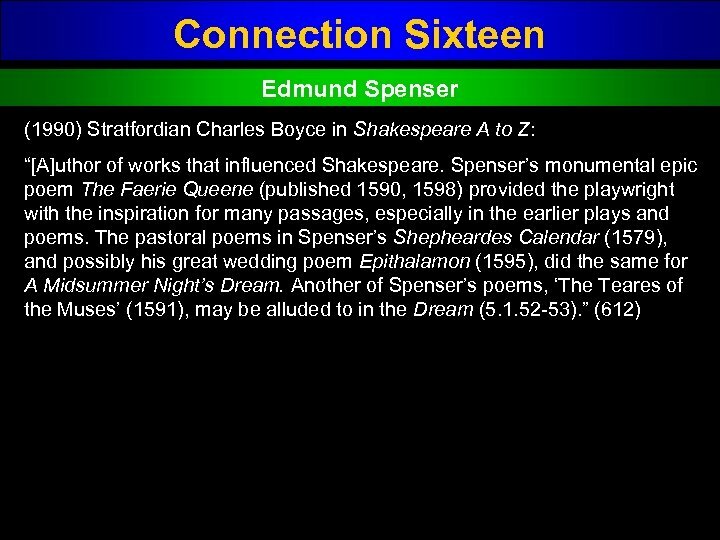 Spenser died in 1599, well within the time of Shakespeare’s fame as a poet and playwright. 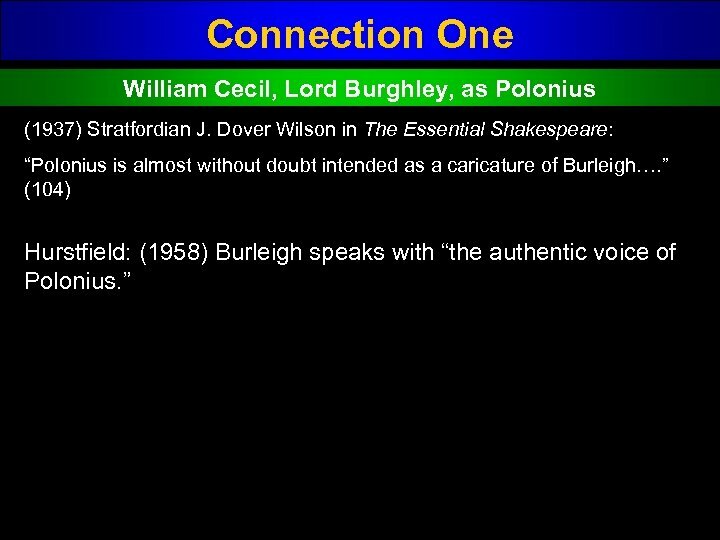 They were the two great poets of that decade. 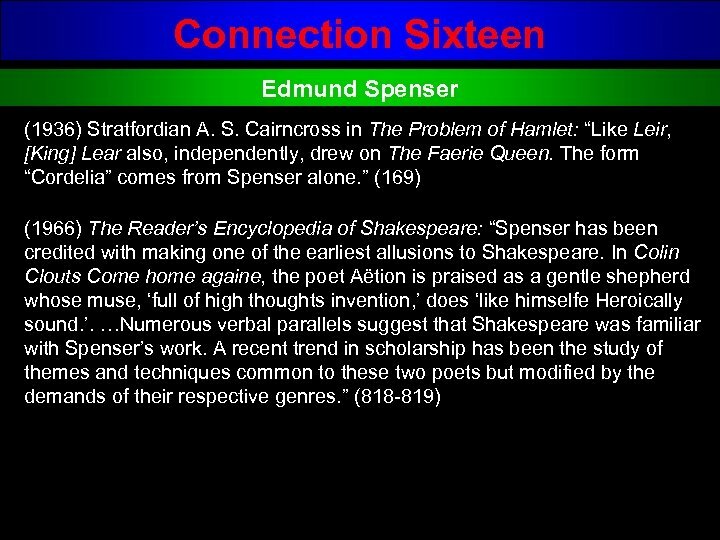 Yet Spenser never mentions William of Stratford and William never mentions Spenser. 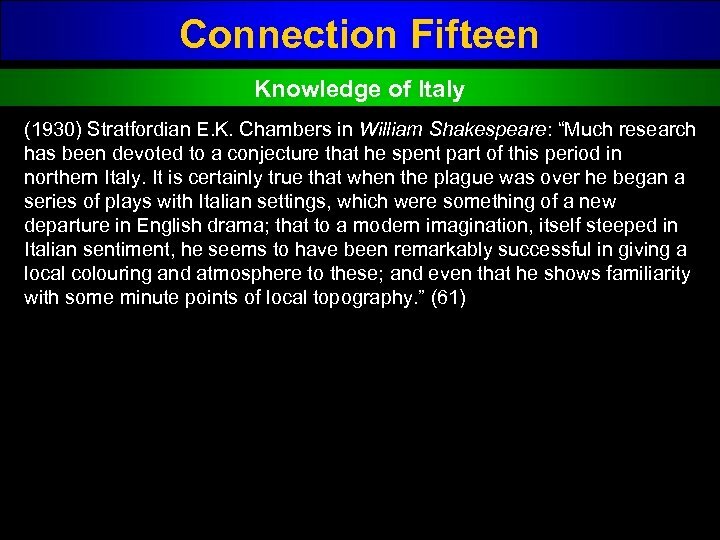 Connection to Shakspere ? 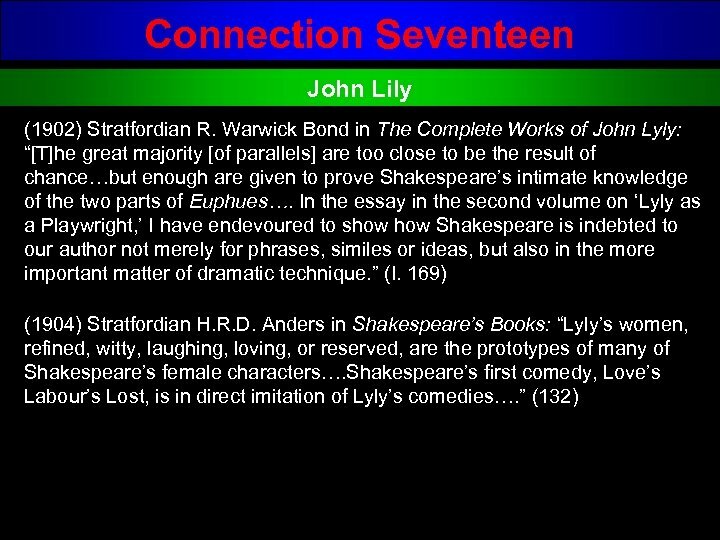 William of Stratford John Lily No known connection. Lyly never mentions William, nor does William ever mention Lyly. 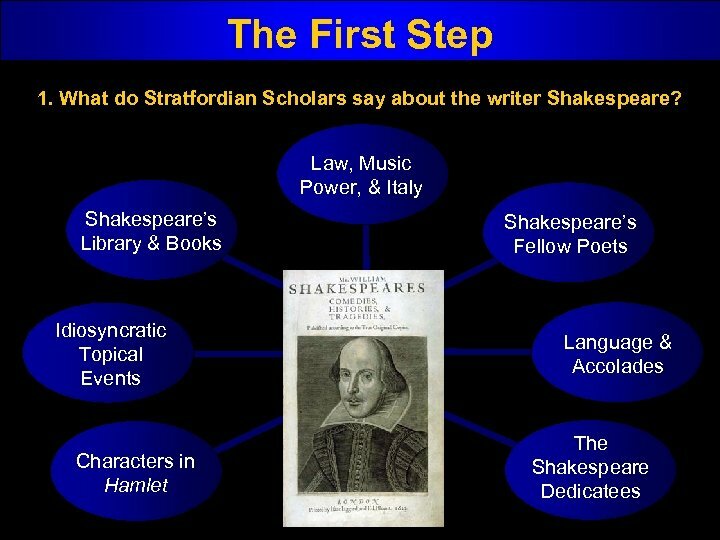 Connection to Shakspere ? 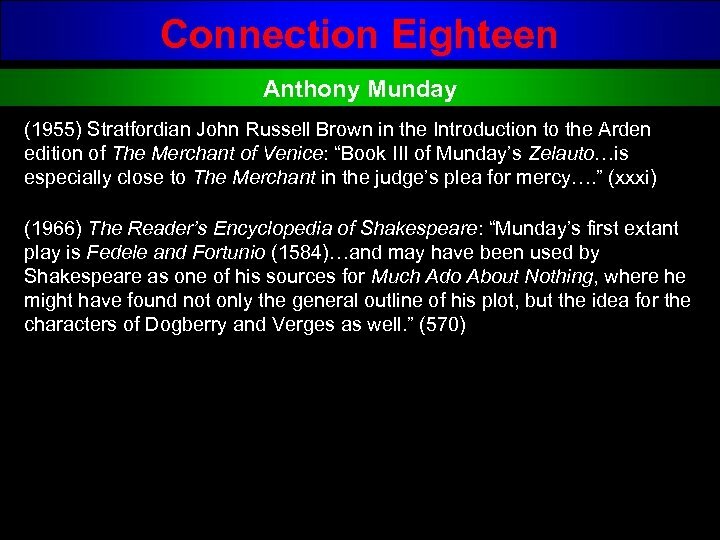 William of Stratford Anthony Munday No known connection. Munday never mentions William, nor does William ever mention Munday. 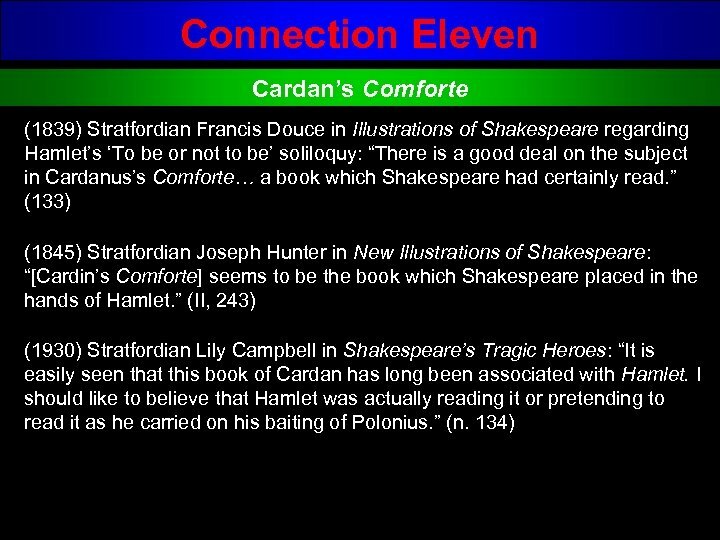 Connection Twenty I Am That I Am (Sonnet 121) Tis better to be vile than vile esteemed, When not to be receives reproach of being; And the just pleasure lost, which is so deemed Not by our feeling, but by others’ seeing: For why should others’ false adulterate eyes Give salutation to my sportive blood? 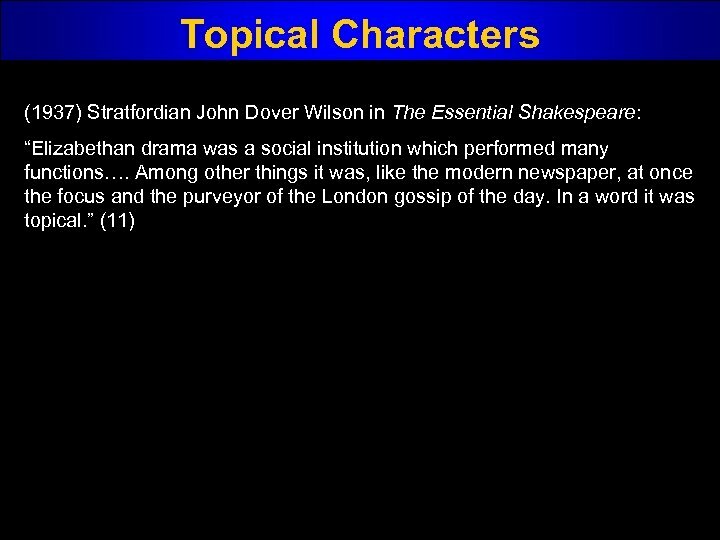 Or on my frailties why are frailer spies, Which in their wills count bad what I think good? 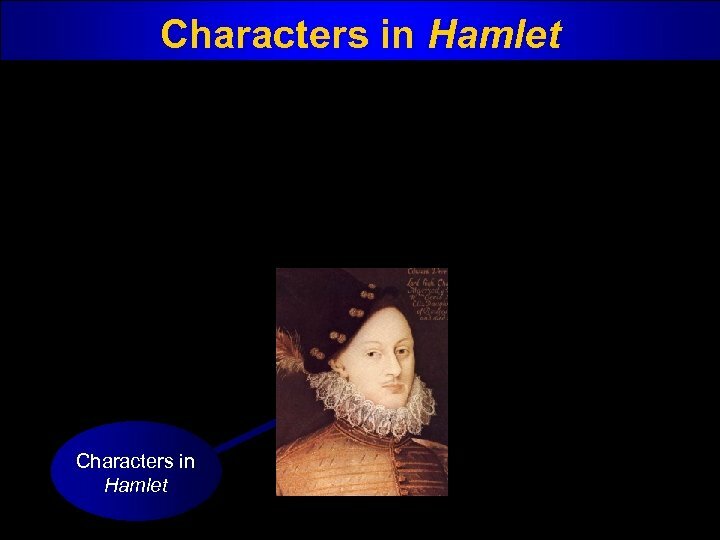 No, I am that I am, and they that level At my abuses reckon up their own: I may be straight, though they themselves be bevel; By their rank thoughts my deeds must not be shown; Unless this general evil they maintain, All men are bad and in their badness reign. 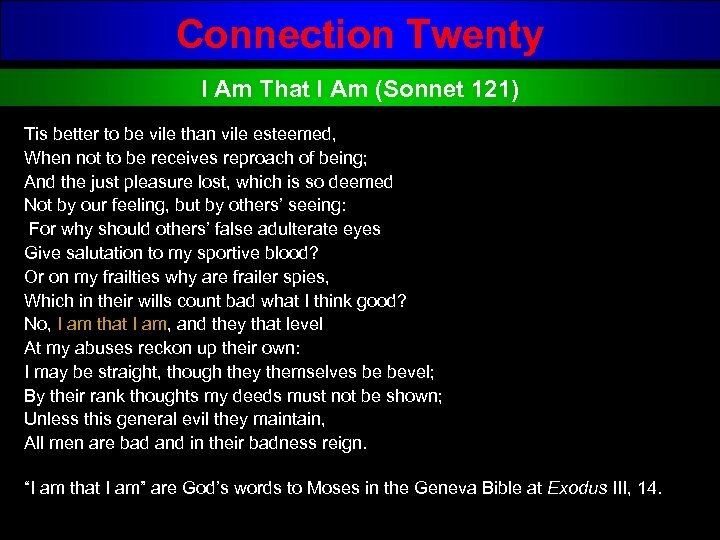 “I am that I am” are God’s words to Moses in the Geneva Bible at Exodus III, 14. 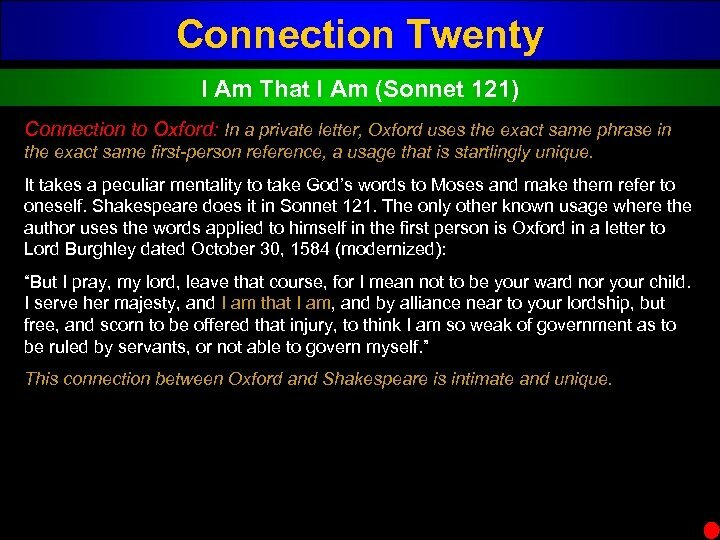 Connection Twenty I Am That I Am (Sonnet 121) Connection to Oxford: In a private letter, Oxford uses the exact same phrase in the exact same first-person reference, a usage that is startlingly unique. 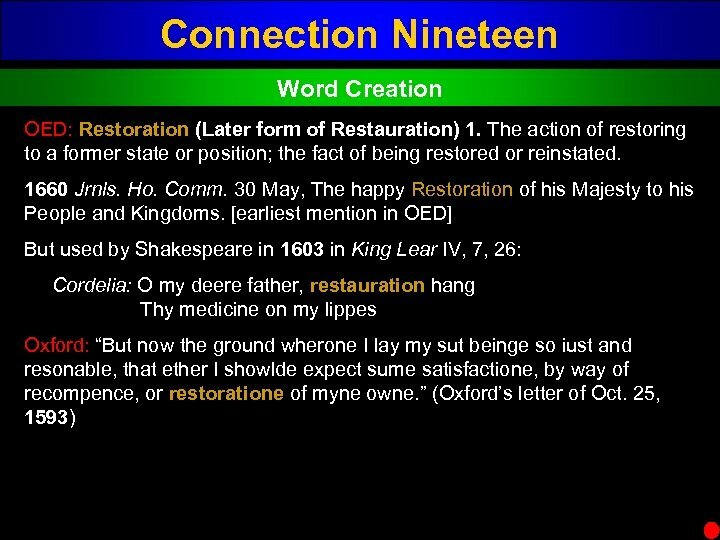 It takes a peculiar mentality to take God’s words to Moses and make them refer to oneself. 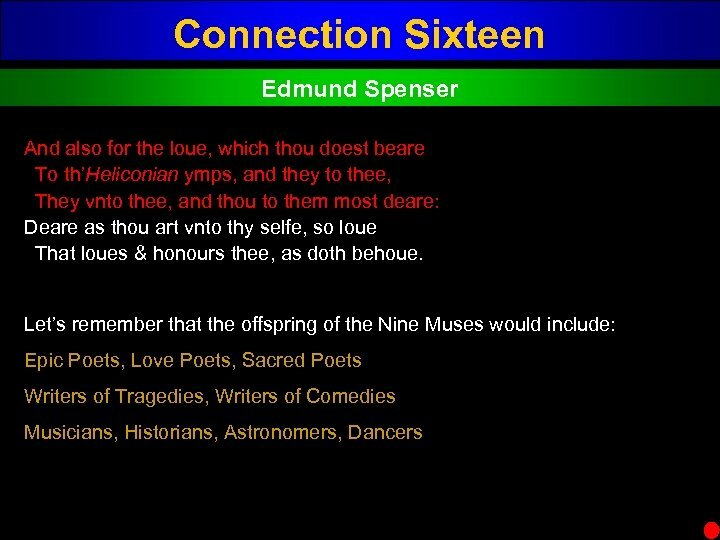 Shakespeare does it in Sonnet 121. 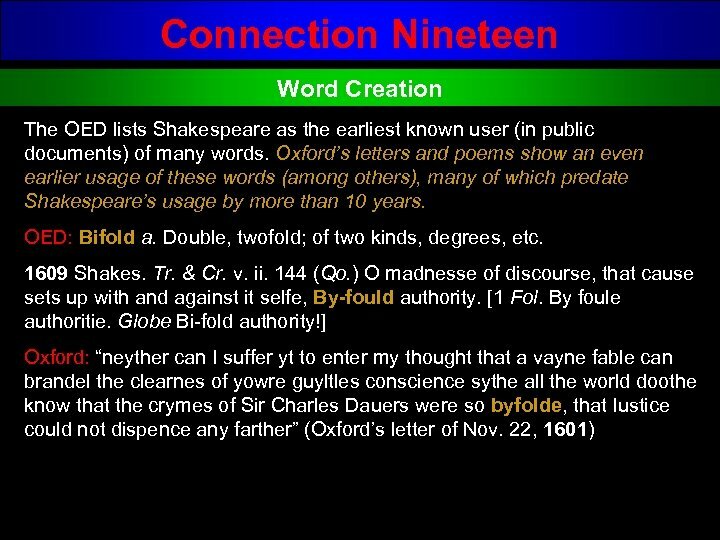 The only other known usage where the author uses the words applied to himself in the first person is Oxford in a letter to Lord Burghley dated October 30, 1584 (modernized): “But I pray, my lord, leave that course, for I mean not to be your ward nor your child. 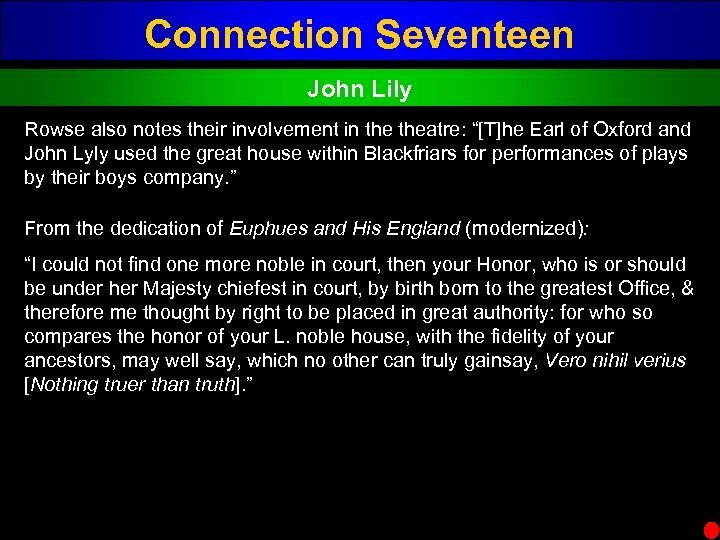 I serve her majesty, and I am that I am, and by alliance near to your lordship, but free, and scorn to be offered that injury, to think I am so weak of government as to be ruled by servants, or not able to govern myself. 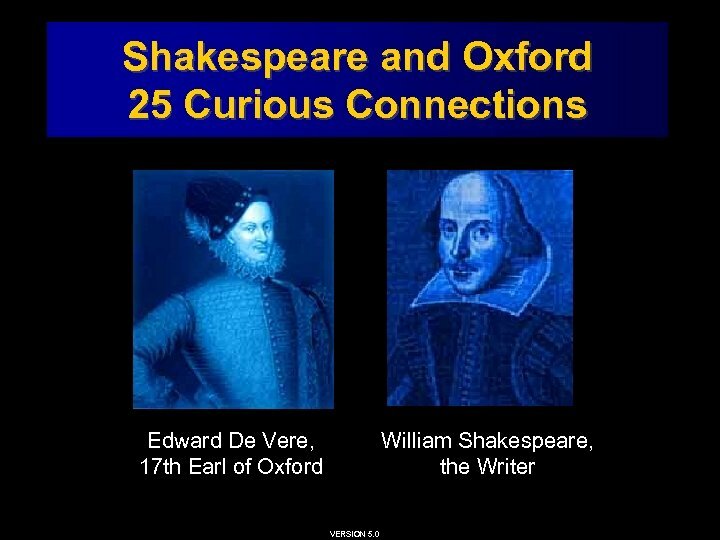 ” This connection between Oxford and Shakespeare is intimate and unique. 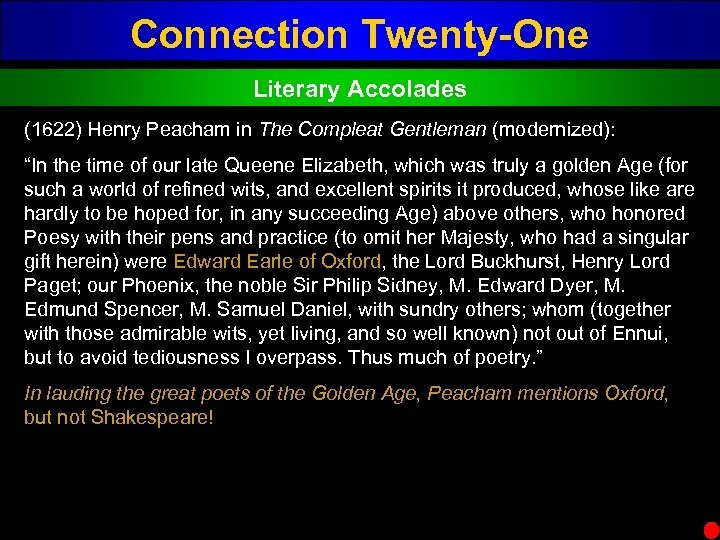 Connection Twenty-One Literary Accolades (1622) Henry Peacham in The Compleat Gentleman (modernized): “In the time of our late Queene Elizabeth, which was truly a golden Age (for such a world of refined wits, and excellent spirits it produced, whose like are hardly to be hoped for, in any succeeding Age) above others, who honored Poesy with their pens and practice (to omit her Majesty, who had a singular gift herein) were Edward Earle of Oxford, the Lord Buckhurst, Henry Lord Paget; our Phoenix, the noble Sir Philip Sidney, M. Edward Dyer, M. Edmund Spencer, M. Samuel Daniel, with sundry others; whom (together with those admirable wits, yet living, and so well known) not out of Ennui, but to avoid tediousness I overpass. Thus much of poetry. 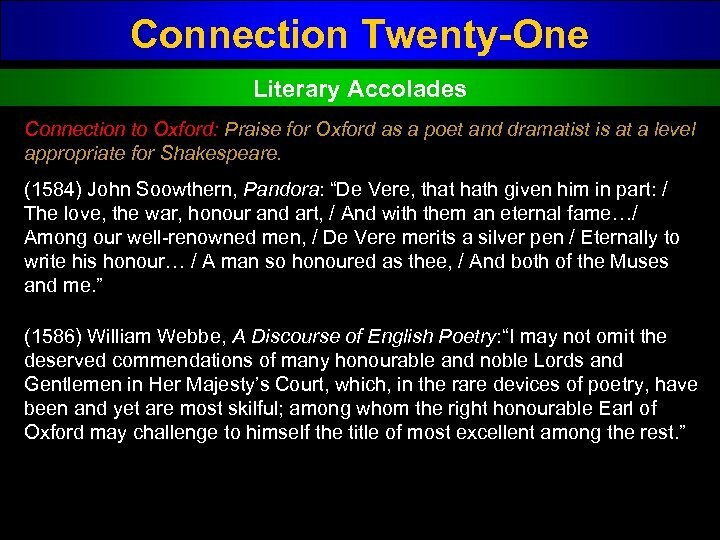 ” In lauding the great poets of the Golden Age, Peacham mentions Oxford, but not Shakespeare! 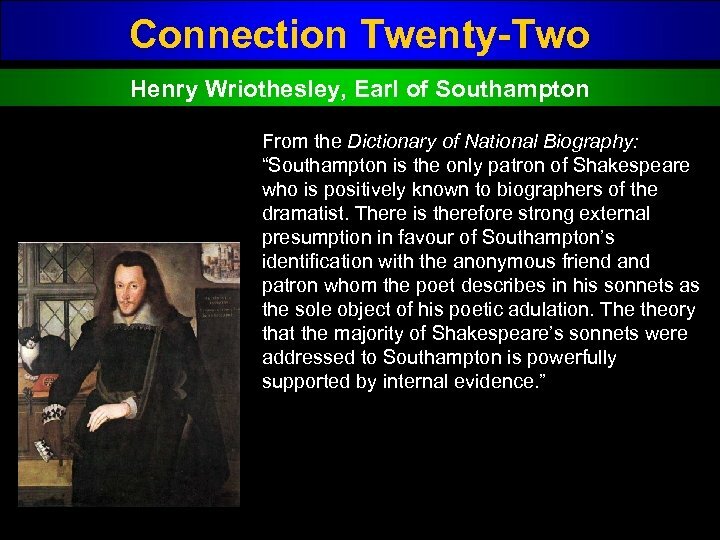 Connection Twenty-Two Henry Wriothesley, Earl of Southampton “In 1594, when most of Shakespeare’s sonnets were probably written, Southampton was the centre of attraction among poetic aspirants. 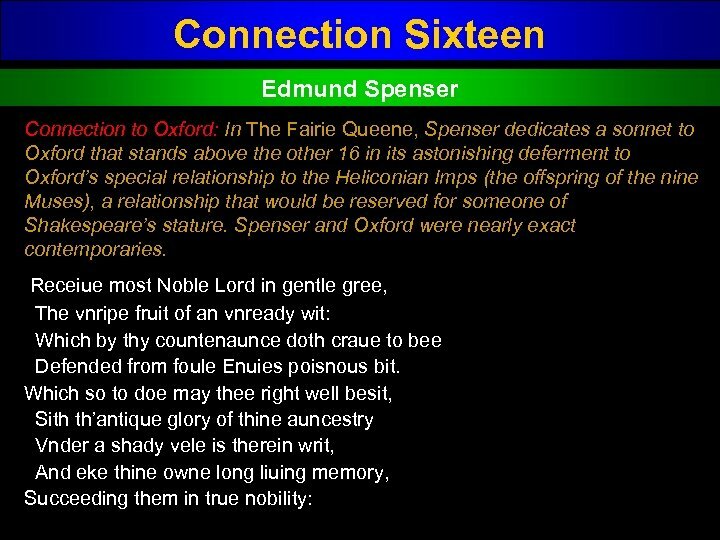 …The opening sequence of seventeen sonnets, in which a youth of rank and wealth is admonished to marry and beget a son so that ‘his fair house’ may not fall into decay, can only have been addressed to a young peer like Southampton, who was as yet unmarried, had vast possessions, and was the sole male representative of his family. 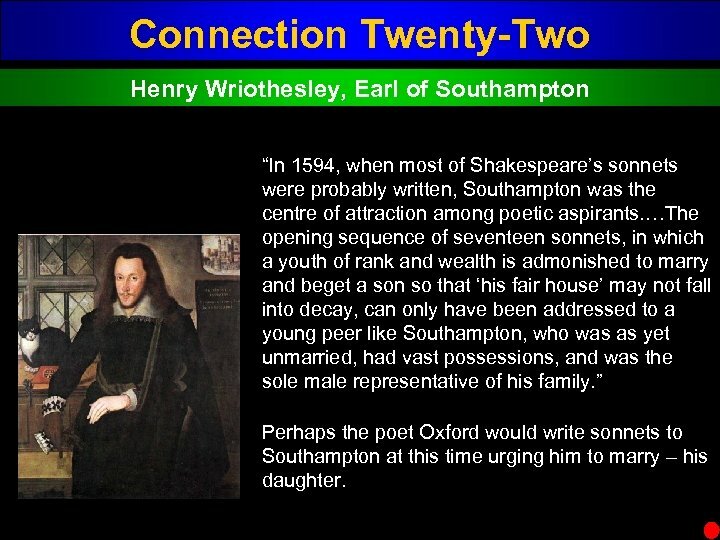 ” Perhaps the poet Oxford would write sonnets to Southampton at this time urging him to marry – his daughter. Connection to Shakspere ? William of Stratford William Herbert, Earl Of Pembroke No known connection. 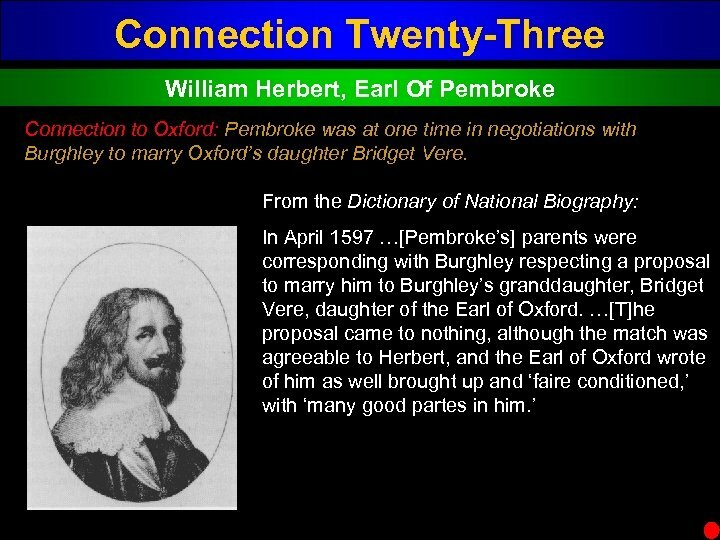 Pembroke never mentions William, nor does William ever mention Pembroke. 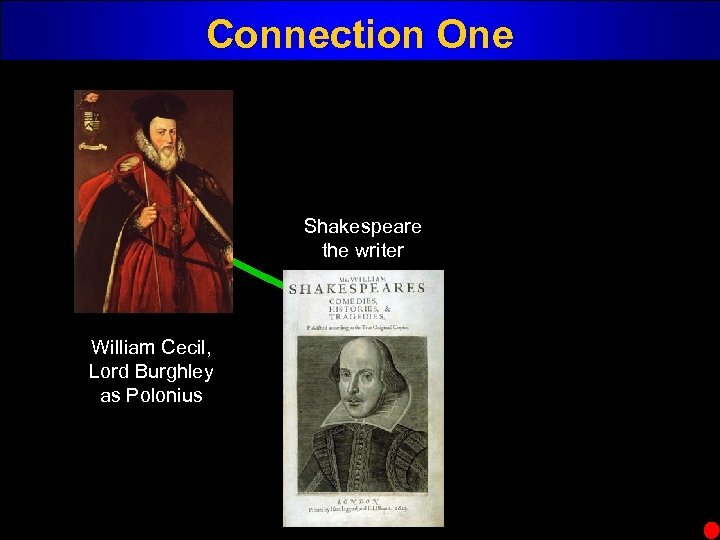 Connection to Shakspere ? 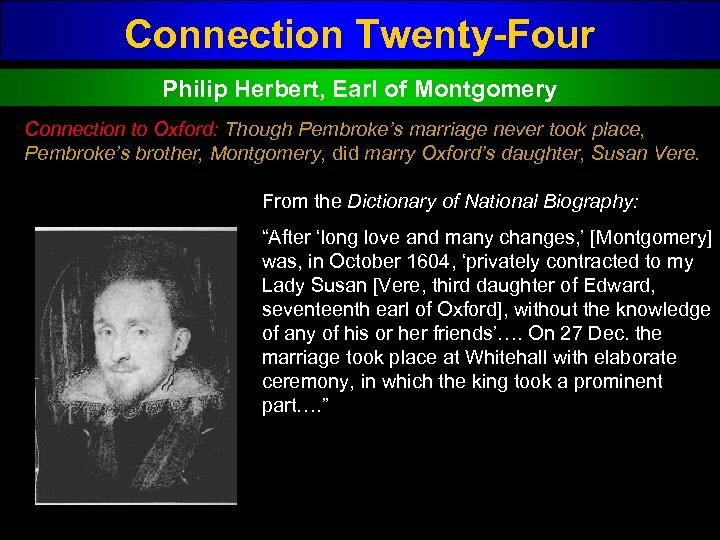 William of Stratford Philip Herbert, Earl of Montgomery No known connection. Montgomery never mentions William, nor does William ever mention Montgomery. 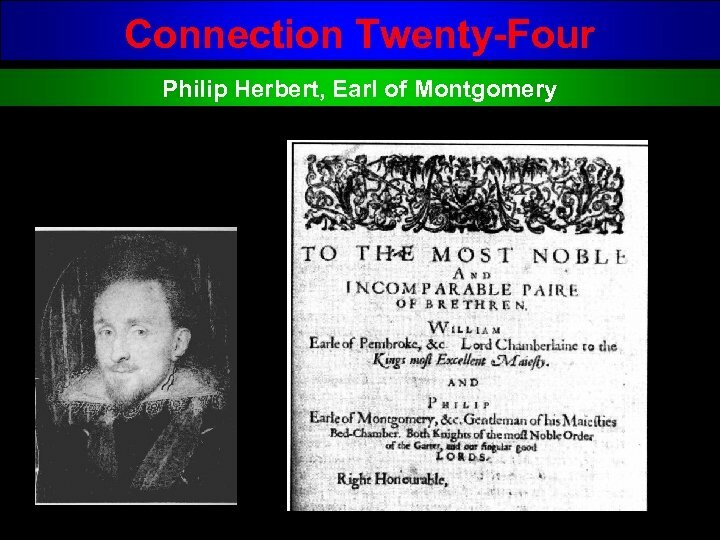 Connection Twenty-Four Philip Herbert, Earl of Montgomery Scholars often speculate how the unpublished plays in the First Folio got into the hands of the publishers. 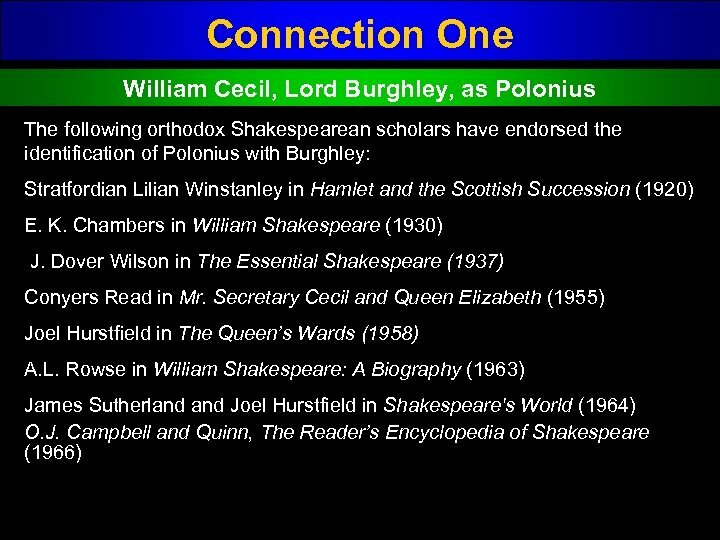 It is reasonable to think that if the author’s daughter were married to someone associated with the First Folio, that would be a likely means of transmittal. 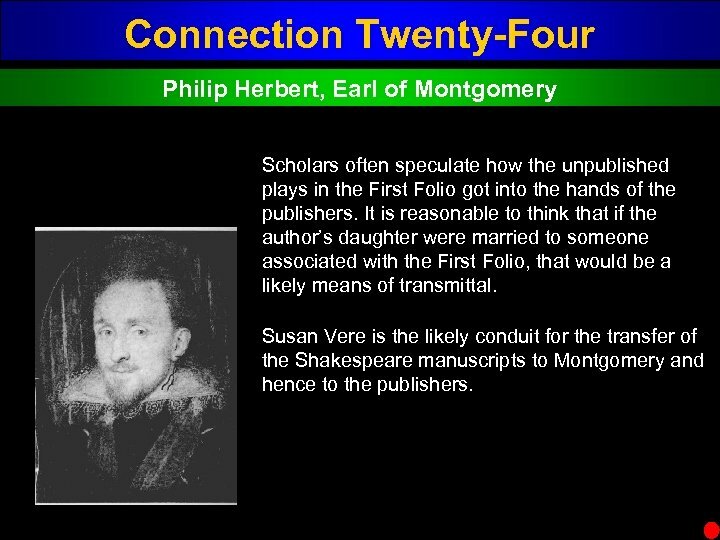 Susan Vere is the likely conduit for the transfer of the Shakespeare manuscripts to Montgomery and hence to the publishers. 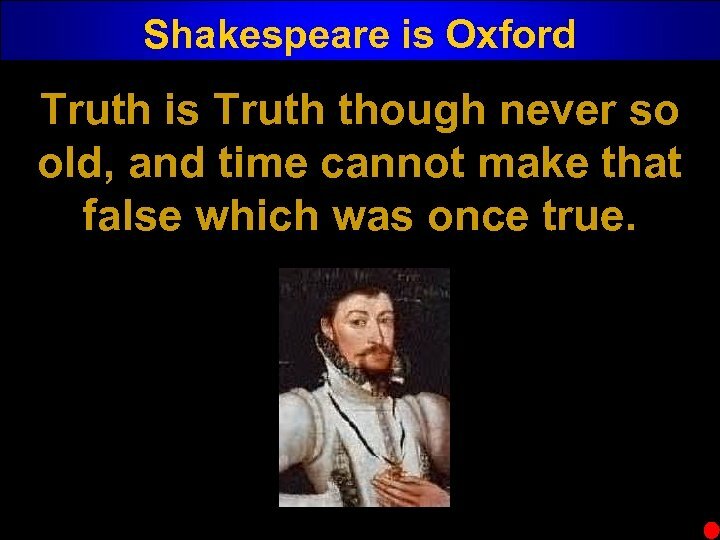 Shakespeare is Oxford Truth is Truth though never so old, and time cannot make that false which was once true.